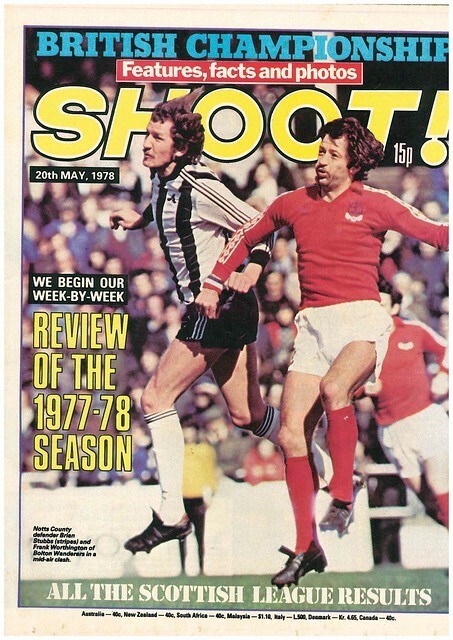 Frank Worthington is one of the cover stars, as Shoot looks forward to the British Championship, while looking back at he 1977-1978 season. Shoot did a double page spread previewing all six games in the British Championship, accompanied by facts and figures of all the teams. England, who didn’t qualify for that year’s World Cup, took the title, winning all three of their games. 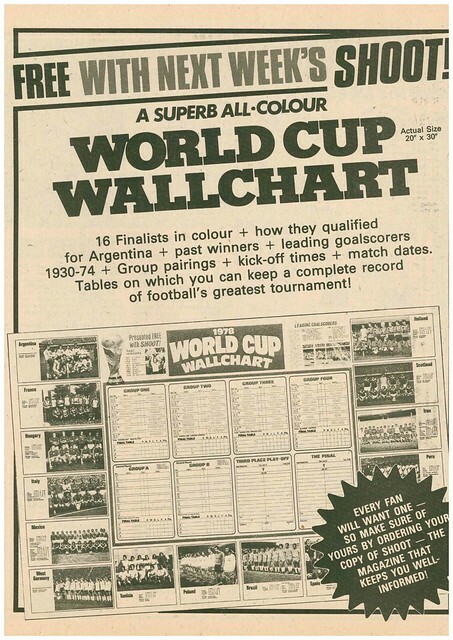 In adverts, there was a full page advert for the following week’s edition, which had a free World Cup wallchart. Ray Clemence uses his column to state that England are desperate to beat Wales, having suffered their first ever Wembley defeat to them in 1977. 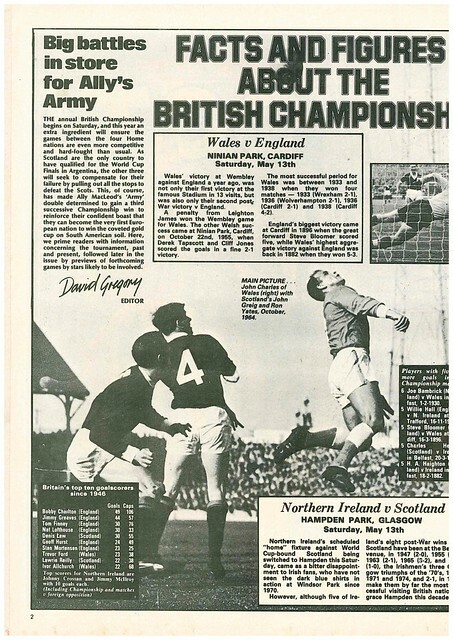 England beat Wales 3-1 at Ninian Park in their opening game of the competition. In news, a thousand fans signed a petition to the IFA for the lifetime bans from international football imposed on Bobby Campbell and Bertie McMinn, for an off-field incident at an underage tournament in 1975. 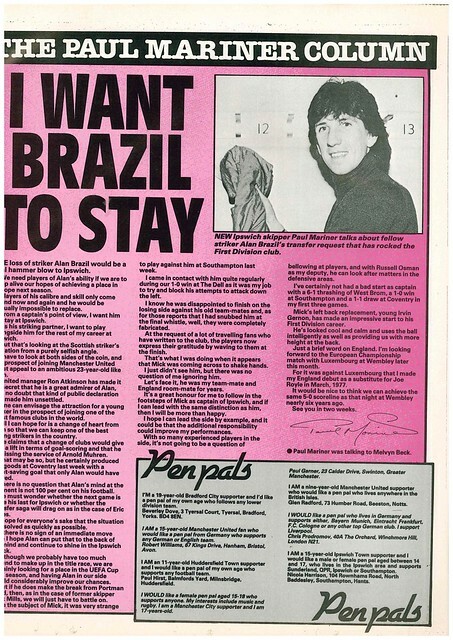 Bobby Campbell was a non appearing squad member at the 1982 World Cup, so obviously, the petition was successful. 17 year old Craig Johnston has broke into the Middlesbrough team, after borrowing £632 from his dad in order to get to England. 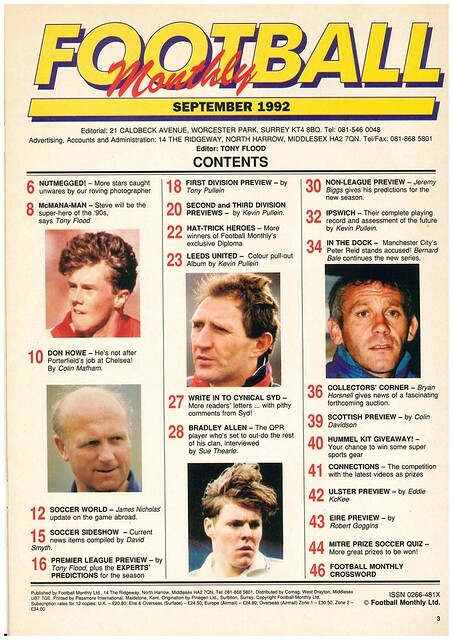 Coventry City are in danger of being known as “The Curly Kids”, with seven players all having perms. Elton John got a full page feature. Yes, the nephew of 1959 FA Cup Final goalscorer Roy Dwight. In 1979, he was the chairman of Watford, just promoted from Division 4. As ever, he wanted a Number 1 – Watford to be in Division 1. He was full of praise for the management team of Graham Taylor and Bertie Mee, and stated he was nervous watching games, even more than when he is on stage. 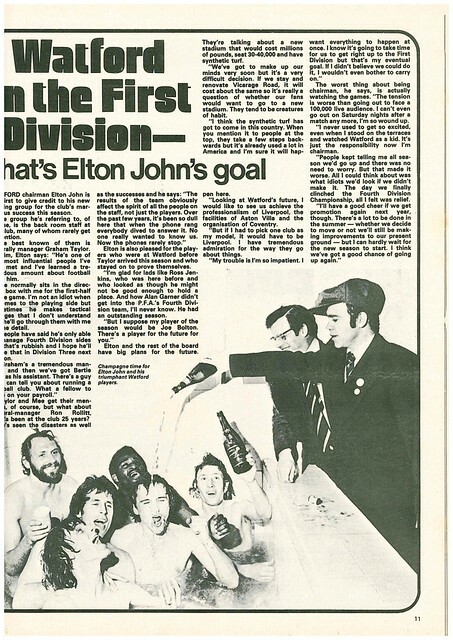 Elton had big plans for Watford, wanting to build a 30-40,000 capacity stadium, and a pitch with synthetic turf. There is a further double page spread on the Home Internationals, with a player from each side giving their thoughts ahead of the games. Andy Gray uses his column to express his disappointment at only being a stand-by player for the World Cup, but he was hoping to make up for it by helping Scotland to a third successive Home Nations title. 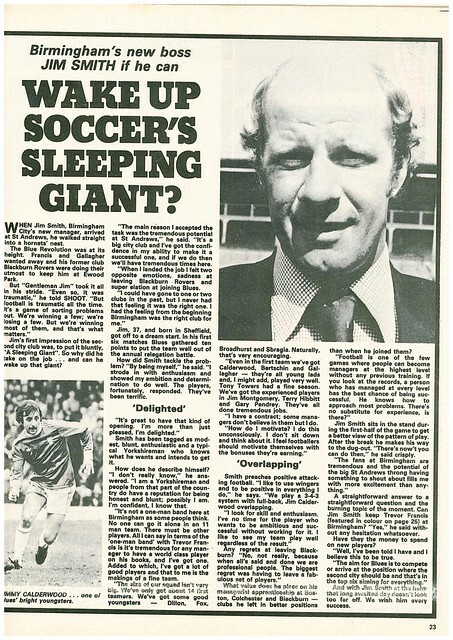 Shoot does a double page spread on Birmingham’s two clubs, with new City manager Jim Smith hoping to wake up what he describes as “A sleeping giant”, while Ron Saunders blames injuries for Aston Villa’s failure to build on their 4th place finish and League Cup win in 1977. 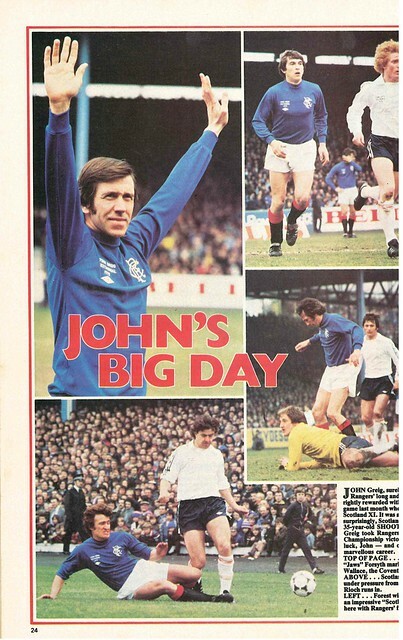 There is a poster of John Greig’s Testimonial, where Rangers beat a Scotland XI 5-0. 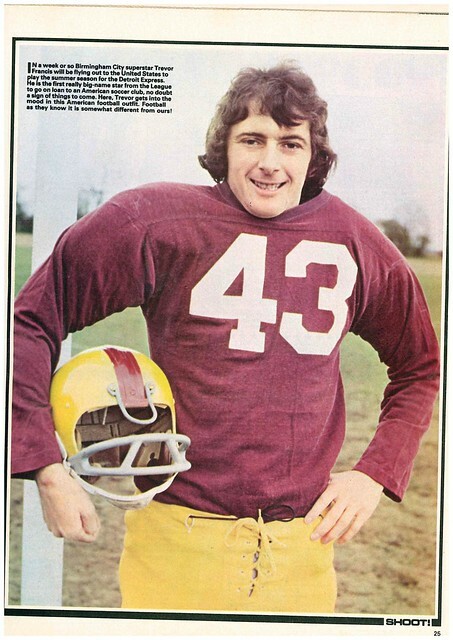 Trevor Francis poses in an NFL uniform, as he is about to head off on a short-term loan to Detroit Express during the pre-season. 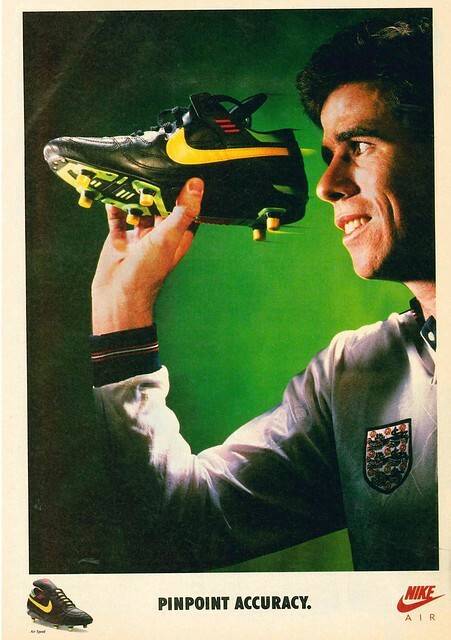 Little did he know it then, Francis would make English football history less than a year later with his next move. In world news, Sepp Maier has signed an Amnesty International petition for the release of political prisoners in Argentina. Talking of Argentina, Alberto Tarantini is being paid by his country’s FA as he is without a club. 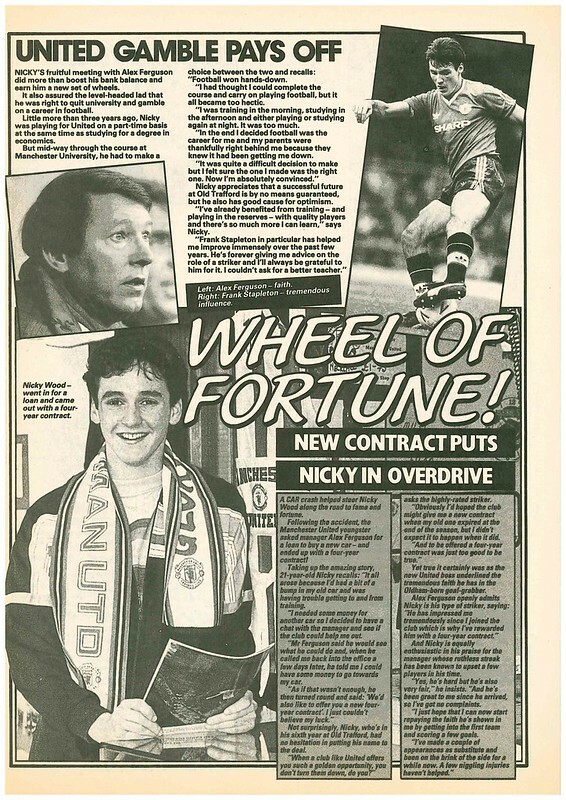 That year, he signed for Birmingham City. Spain defender Jose Camacho was ruled out of the World cup through injury, while priests in West Germany have been sent a schedule of World Cup games, in order to avoid clashing services with matches. 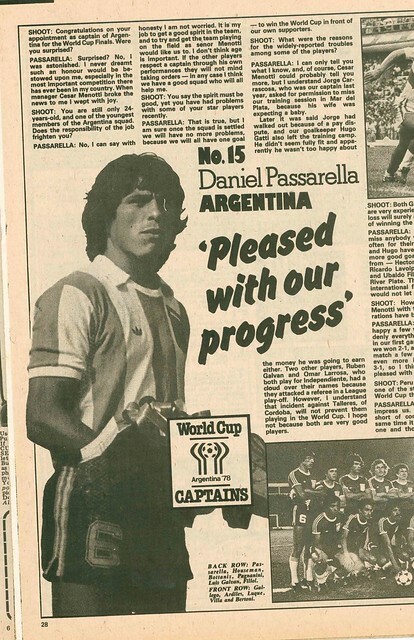 Daniel Passarella gets a double page interview ahead of the World Cup. When asked about Peru, he said he wasn’t impressed with them. That didn’t come back to bite them, as Argentina beat Peru 6-0 in the 2nd Round group stage. 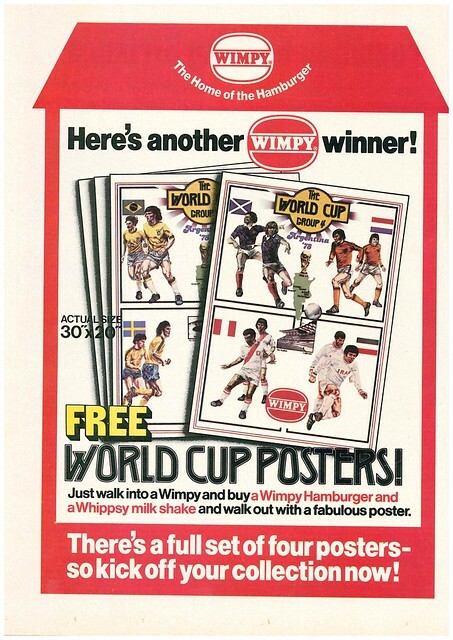 In adverts, you could get four World Cup posters (of the four groups) in Wimpy. All you had to do was buy a burger and milkshake. 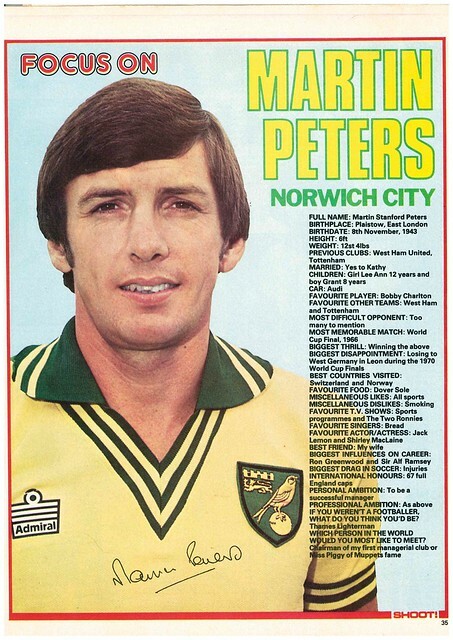 Martin Peters gets a profile, where he states his favourite band is Bread, and he would most like to meet Miss Piggy. 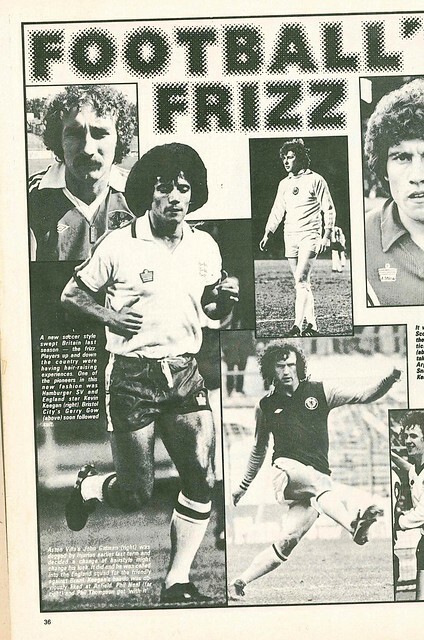 Shoot dedicates a page to a new trend in football – perms, with a photo collage of footballers who have perms. 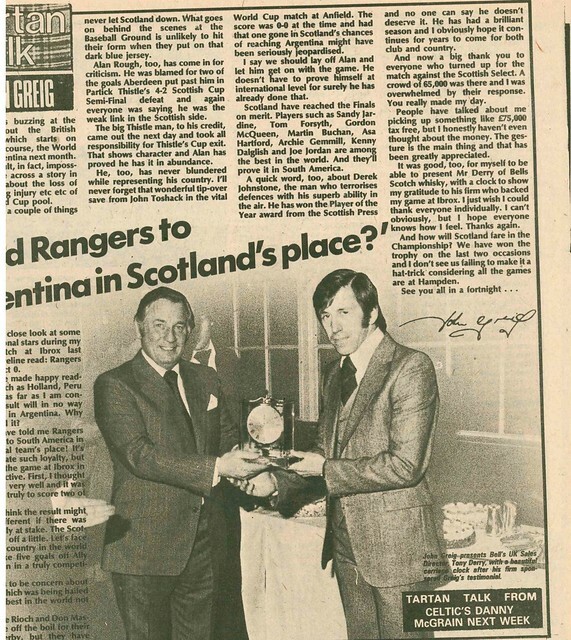 Meanwhile, John Greig says fans have been telling that Rangers should replace Scotland in the World Cup, after they beat a Scotland XI 5-0 in his Testimonial. 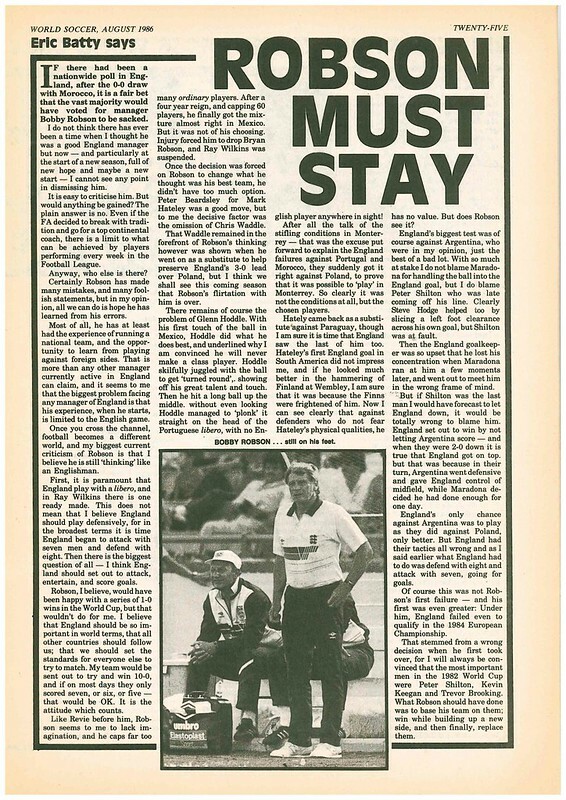 Gordon Hill uses his column to state that, following his departure from Manchester United, if he didn’t rejoin his former United boss Tommy Docherty at Derby County, he would have gone to America to play. 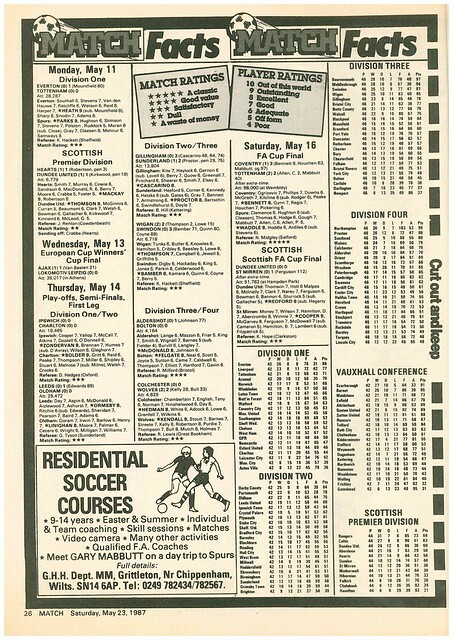 To finish, getting people in the mood for the World Cup, is a double page spread on the club form of Scotland’s squad, as the tournament in Argentina approaches. 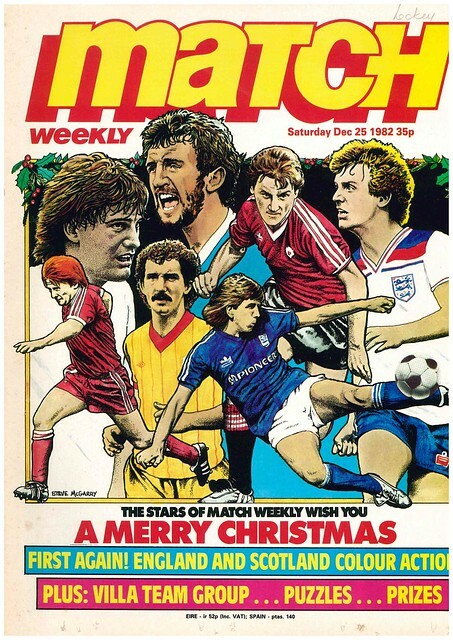 It’s Christmas 1982 and Match celebrates with a cover image of a sketch of various football stars such as Gordon Strachan, Graeme Souness, Steve Coppell and Paul Mariner. There’s not much Christmas cheer for the FA, as they come in for criticism for arranging a full top flight fixture list just four days before a European Championship Qualifier. A series of top flight stars are asked for their Christmas wishes, with Lou Macari wish he could spend Christmas Day with either Russ Abbot or Benny Hill. 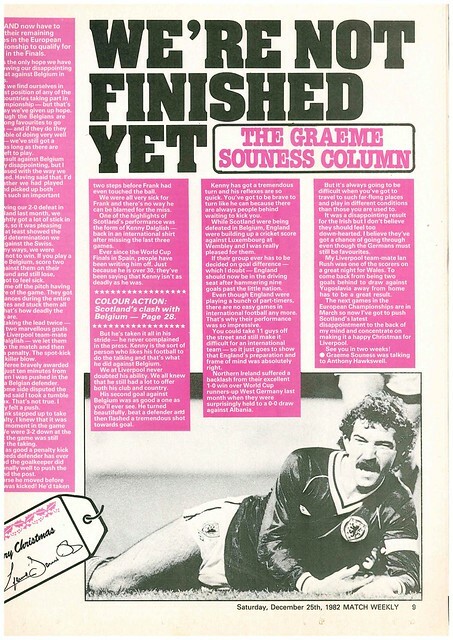 Graeme Souness uses his column to state that Scotland haven’t given up on qualifying for Euro 84 despite a poor start which means they have to win the remainder of their games to have a chance of qualifying. 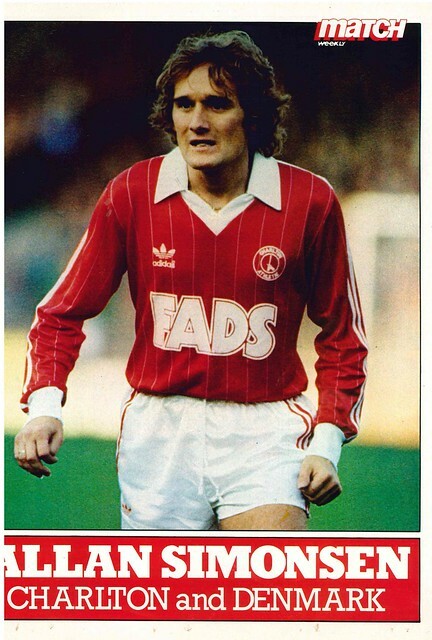 John Gregory of QPR is this “Focus On …” subject, claiming that The Jam, Robert Palmer and Japan is his favourite music. 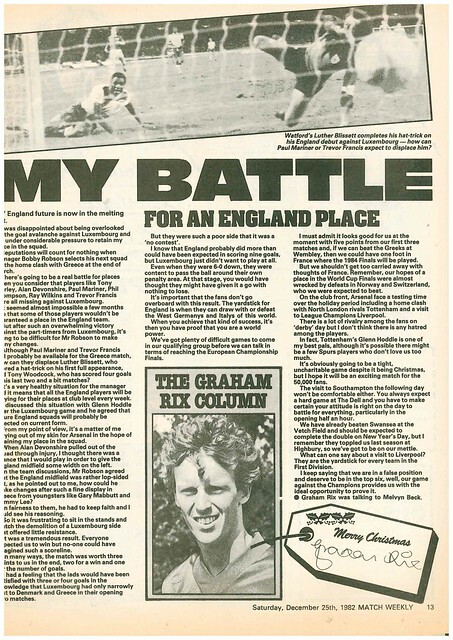 Moving from Scotland to England, as Graham Rix uses his column to state that he has a battle for his England place after missing out on the recent 9-0 win over Luxembourg. David Cross has only one wish for Christmas, three points from Manchester City’s visit to Anfield, something that City managed the previous season when they won 3-1 at Anfield. 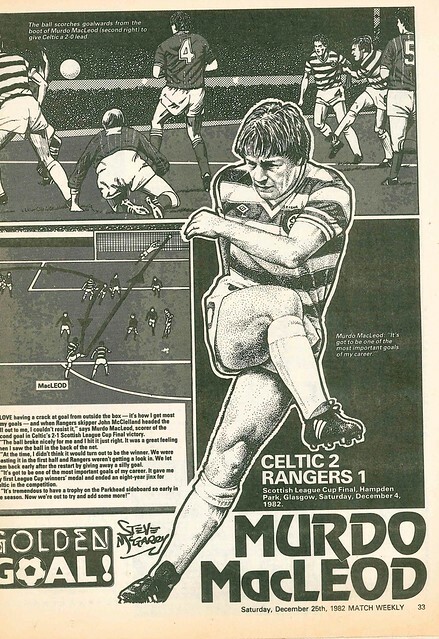 As well as sketching the front cover, Steve McGarry can be found again near the end of the magazine sketching Murdo MacLeod’s winner for Celtic against Rangers in the recent Scottish League Cup Final. 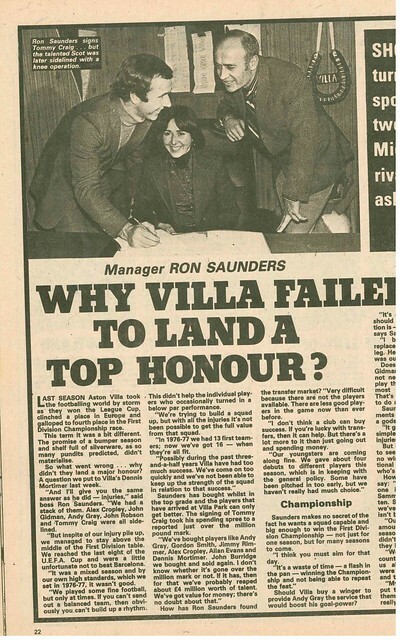 The magazine can’t end without another rant about the scheduling of England’s match against Luxembourg, this time Tony Morley of Aston Villa who had to miss the game as he was playing for Villa in the World Club Cup Final in Japan the weekend before. 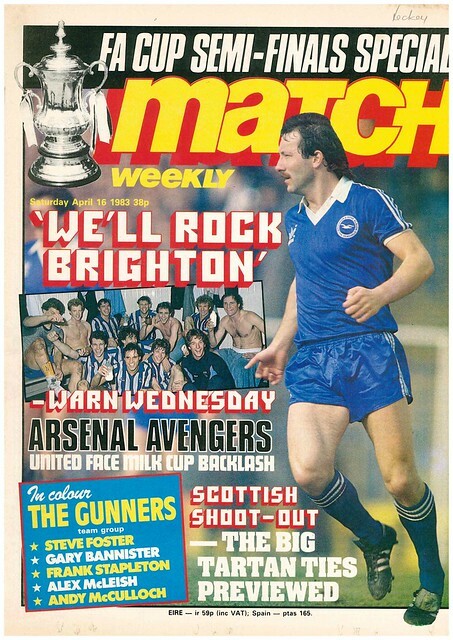 Jimmy Case of Brighton is the cover star of this edition of Match, previewing the FA Cup Semi-Finals, where Brighton face Sheffield Wednesday while Arsenal look to avenge their League Cup Semi-Final defeat to Manchester United by beating them in the FA Cup. Scottish Cup Semi-Finals are also previewed, with Match dubbing them “The big Tartan Ties”. As you open the magazine, there are two double page previews of the two FA Cup Semi-Finals. 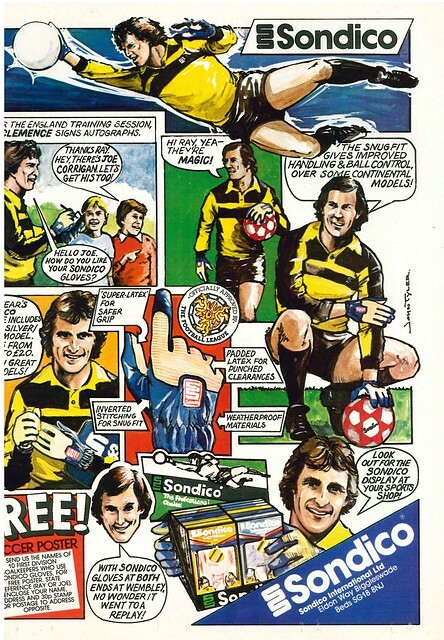 In adverts, Steve Coppell is used to promote books on careers advice for people whose goal is a good job. 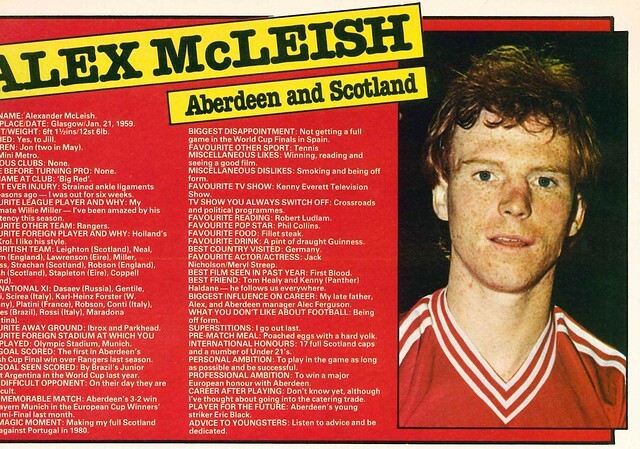 Alex McLeish is the subject of this week’s profile, revealing that his favourite singer is Phil Collins and his footballing ambition is to win a European trophy with Aberdeen. 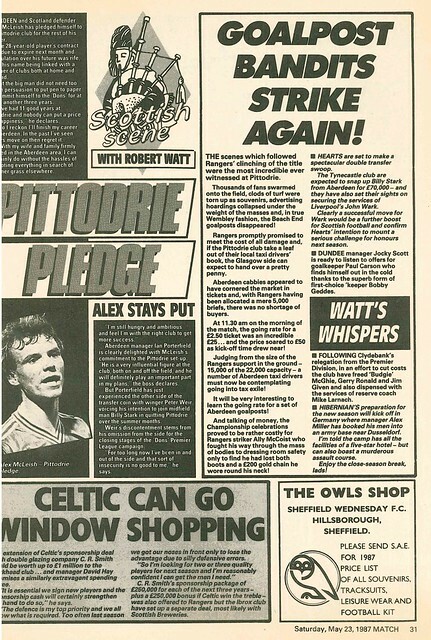 The two Semi-Finals in Scotland are profiled, with Hibs star Alan Rough predicting that Celtic will beat Aberdeen and that Rangers will beat St Mirren. 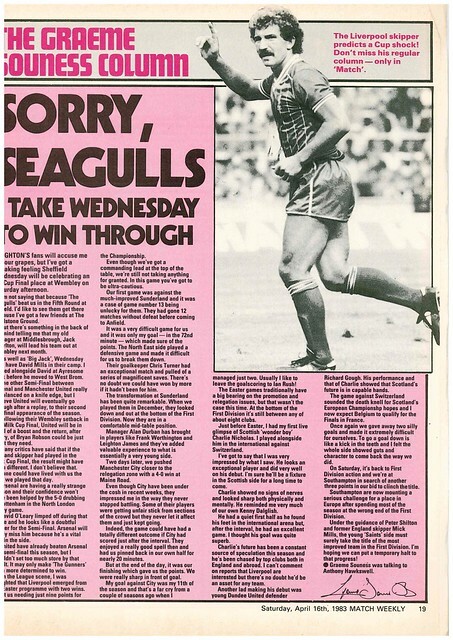 Graeme Souness begins his column by apologising to Brighton fans, as he believes that they will lose their FA Cup Semi-Final to Sheffield Wednesday. 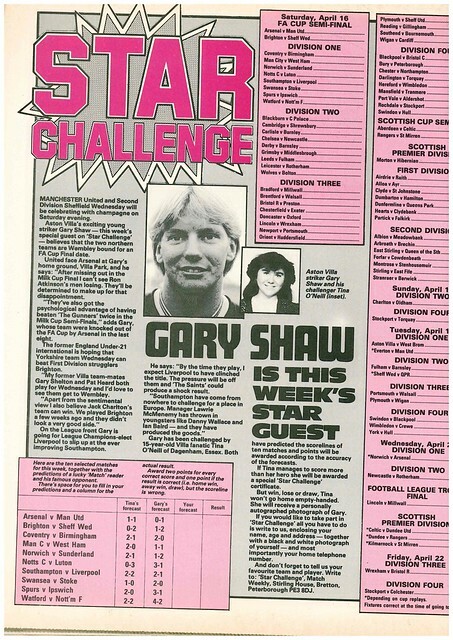 Gary Shaw of Aston Villa is doing predictions, up against a Villa fan from Essex. 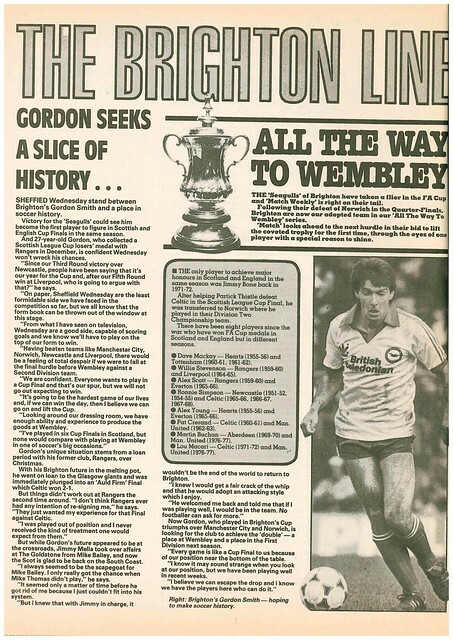 Shaw hopes that Wednesday beat Brighton in the FA Cup Semi-Final as Wednesday have a couple of ex Villa players. 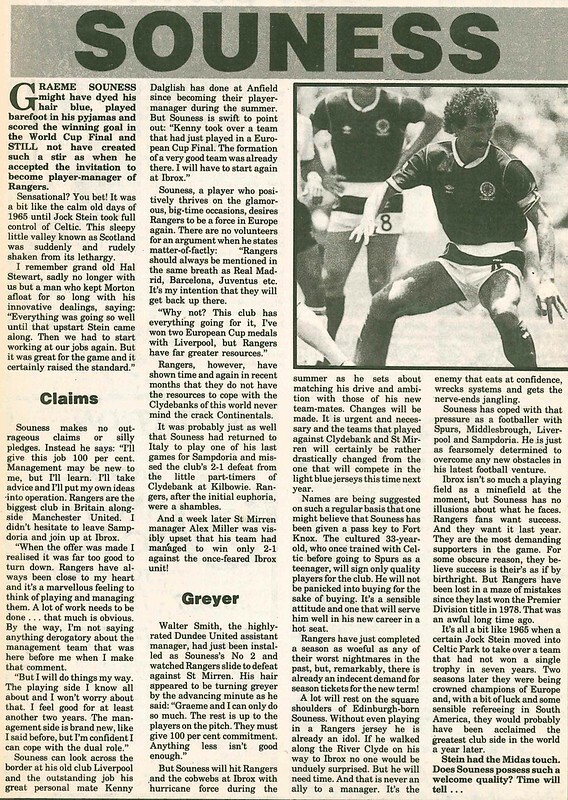 Meanwhile, Frans Thijssen is leaving Ipswich Town to join Vancouver Whitecaps, and he looks back at his time in England. 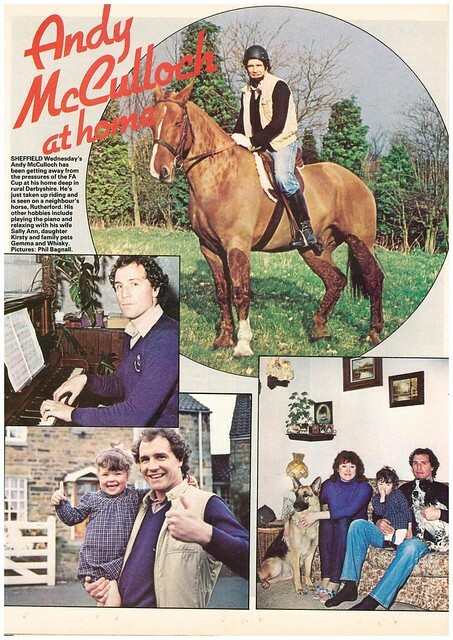 Match visits the home of Sheffield Wednesday star Andy McCullough, photographing him as he rides a neighbour’s horse through rural Derbyshire. 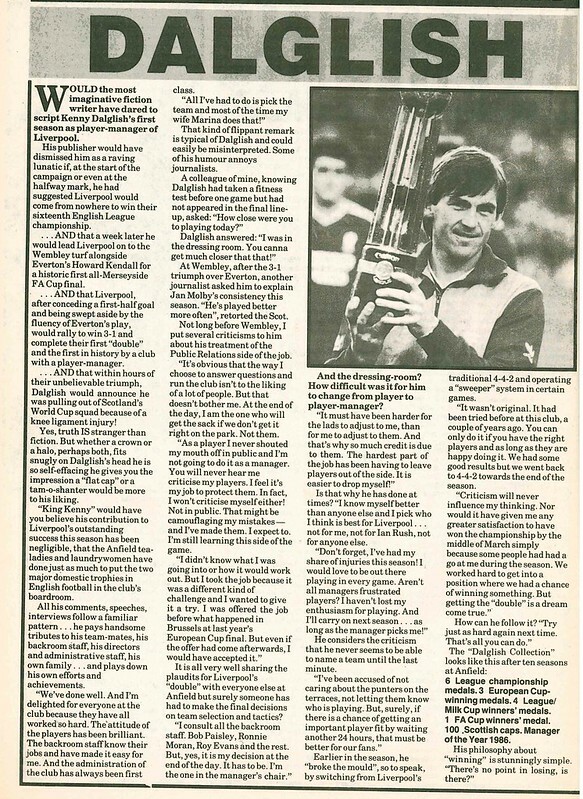 The magazine ends with a profile of new Scotland cap Richard Gough, who revealed that he almost quit football after being homesick for South Africa, where he grew up. 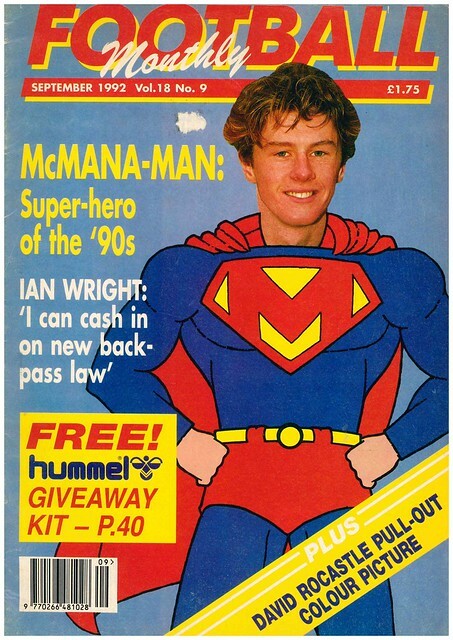 Steve McManaman is mocked up as a superhero called McMana Man for the cover image, as he is described as English football’s superhero for the 1990s. Ian Wright is interviewed and has modest ambitions for 92/93 – to get in the England team and to win the Premier League and FA Cup with Arsenal, predicting that he can make the most of the new backpass rule which stops goalkeepers picking the ball up from a backpass. Steve McManaman is the subject of a double page feature, predicting he will become Liverpool’s greatest ever player, as well as tributes from the likes of Alan Hansen, Bruce Grobbelaar and Bradley Allen. 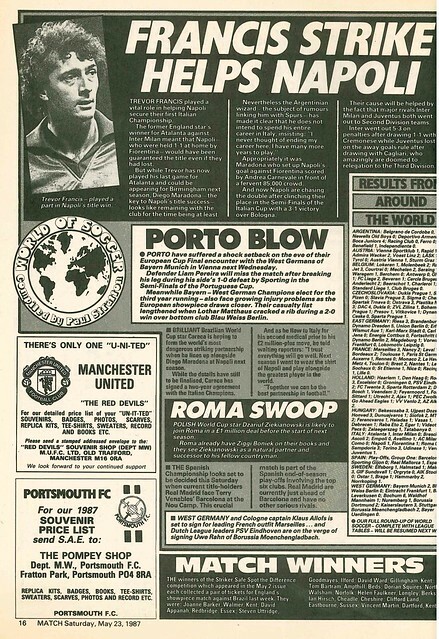 Don Howe is the subject of a profile, having just joined Chelsea as a coach, and his happy to be in that role rather than being a manager. In world news, Marseille’s new signing Rudi Voeller believes that he can score the goals to win the European Cup for the French club. Meanwhile, Manchester United have rejected a bid from Derby County to sign Bryan Robson, with the Rams hoping he would have had the same effect on them in the 90s as a similarly aged Dave Mackay did in the 1970s. 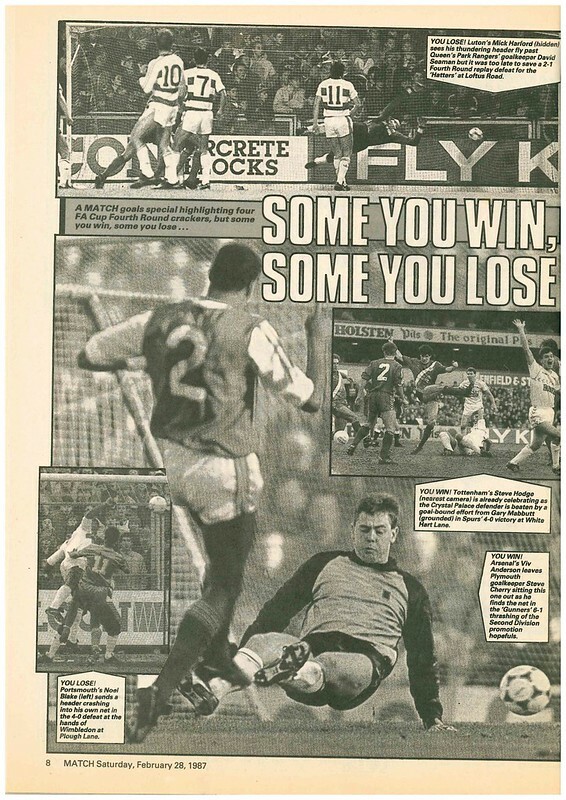 The forthcoming Premier League season is previewed, with all the Football Monthly journalists predicting that Arsenal will be champions in 1993. 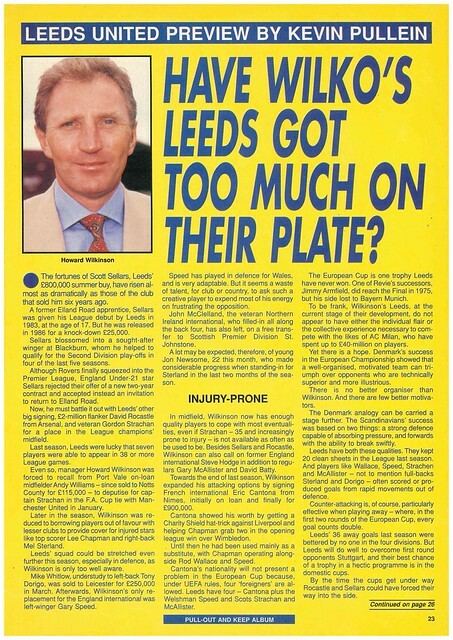 Leeds United get a four page profile as they get set to defend their league title, looking at their success over the past four years under Howard Wilkinson. The new Non League season is previewed, with Wycombe Wanderers being predicted to win promotion to the Football League. 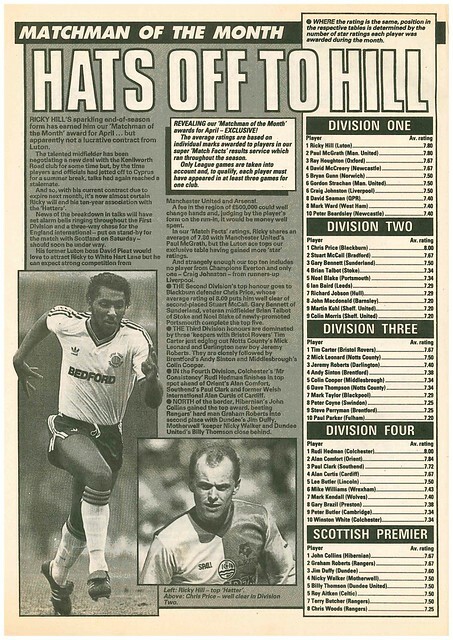 Manchester City manager Peter Reid is interviewed, stating he stands by all his decisions, with City hoping to launch a title bid having come 5th in 1992. In Scotland, the return of Trevor Steven to Rangers makes them favourites to win the title in 1993. 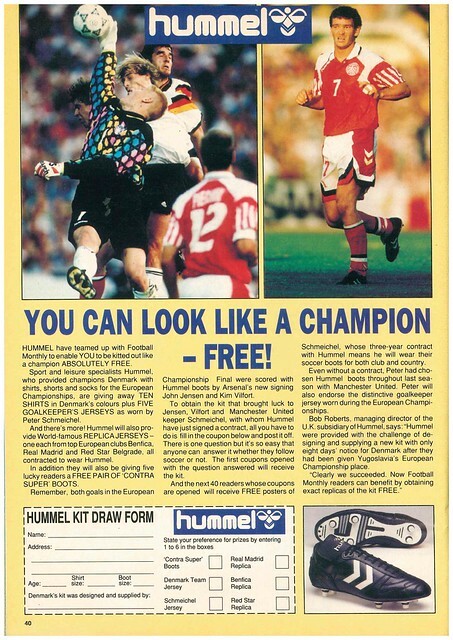 In competitions, you could win with Hummel, but you had a choice of a pair of boots or a replica shirt of either Benfica, Denmark or Real Madrid. The preview of the new Irish League season predicts Glentoran to pip Linfield to the title and Ards to win the Irish Cup. 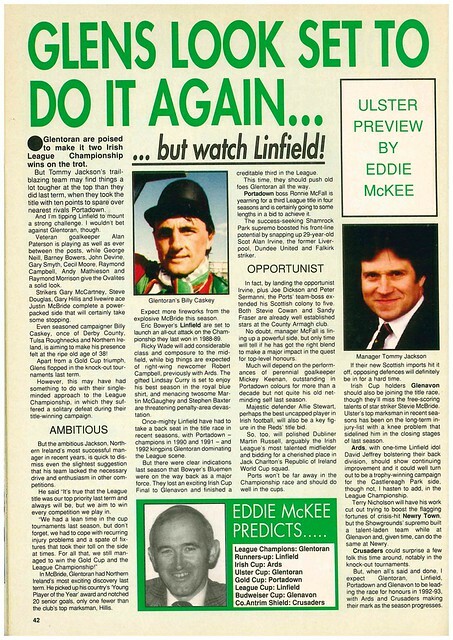 Ards lost the Final while Linfield won the league. In Republic of Ireland, there are concerns that easier access could affect attendances at domestic games, while Bohemians are predicted to win the league. 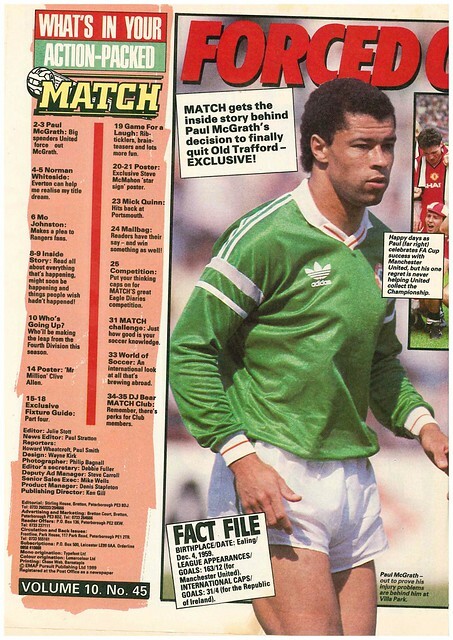 Paul McGrath, in action for Republic Of Ireland, is the cover star, as Match leads with the headline “FORCED OUT!”, with McGrath having just left Manchester United for Aston Villa. 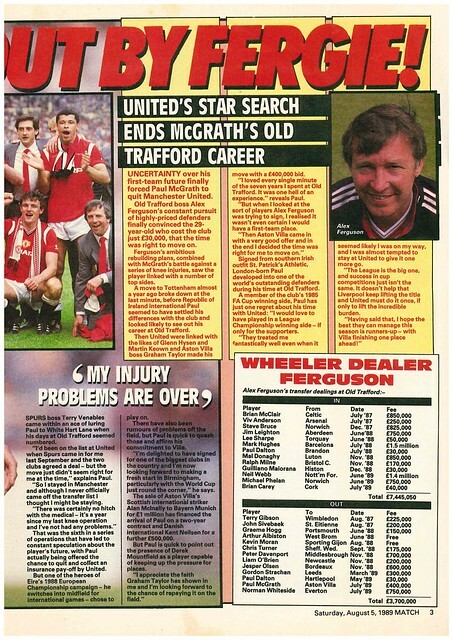 As you open the magazine, there is an interview with McGrath, who tells Match that Manchester United’s search for a Central Defender left him with no option but to sign for Aston Villa, almost a year after a move to Tottenham Hotspur broke down. 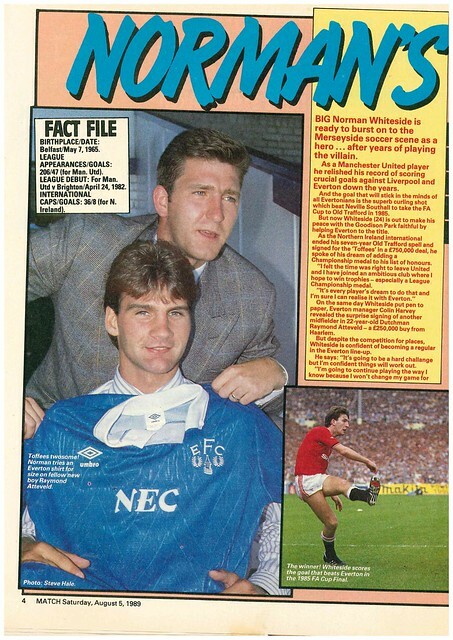 When you turn over the page, there is an interview with Norman Whiteside, who feels his move to Goodison Park will help his ambition of winning a league title. 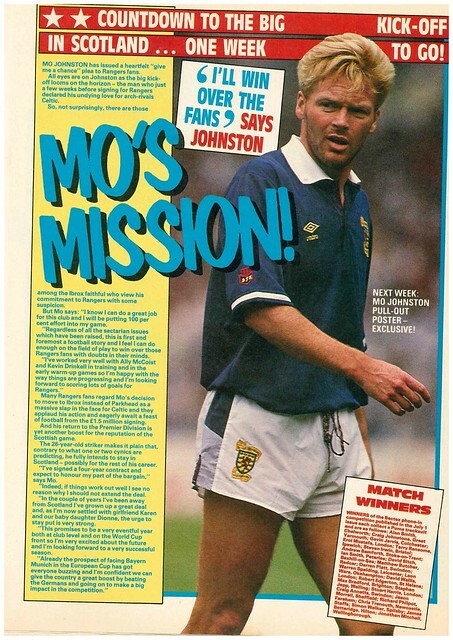 With a new season about to start in Scotland, Mo Johnston tells Match he wants to win over the Rangers fans, having previously played for Celtic, adding that he is confident of Rangers making an impression in the European Cup, despite being drawn against Bayern Munich in the group stages. Staying in Scotland, Hibs goalkeeper Andy Goram has received a dressing down for leaving Hibs pre-season training to play international Cricket for Scotland. Arsenal will be playing Independiente in a friendly in Miami, which will be broadcast live on ITV that weekend. Another English club on tour in 1989 were Ipswich Town, becoming the first English club to tour the Soviet Union. 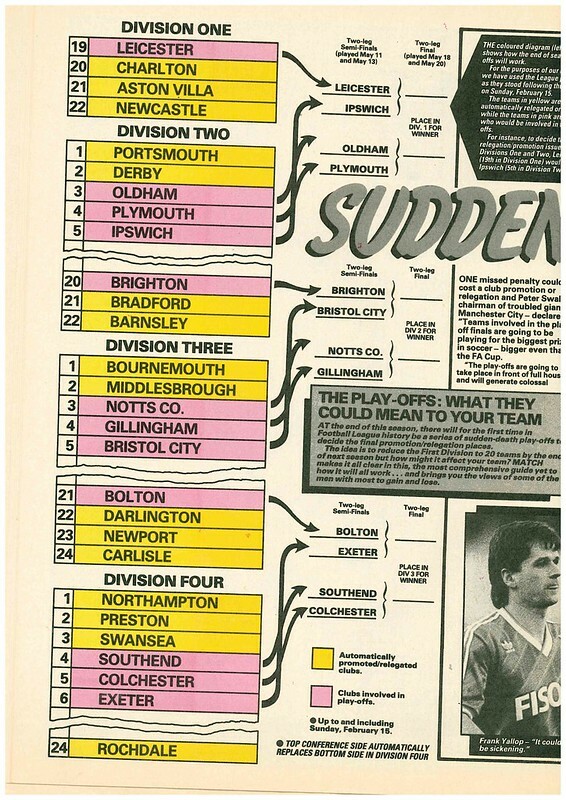 Division Four gets previewed, with both Ian Muir of Tranmere and Tony Grealish of Rotherham expecting Scunthorpe United to win the division in 1990. They finished 11th. 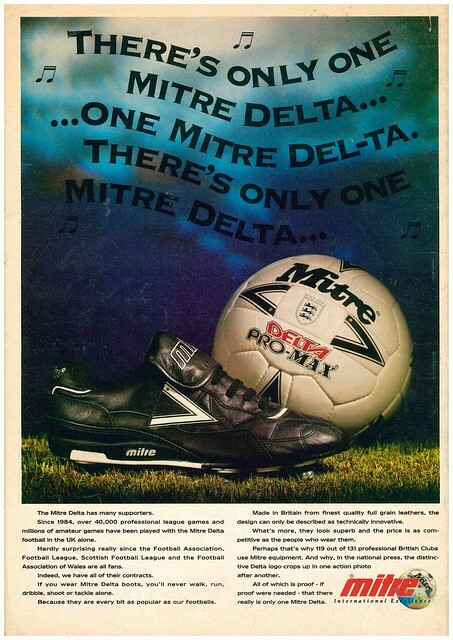 In ads, John Barnes and Graeme Souness were advertising Diadora, while Jennifer Saunders was advertising Nat West. 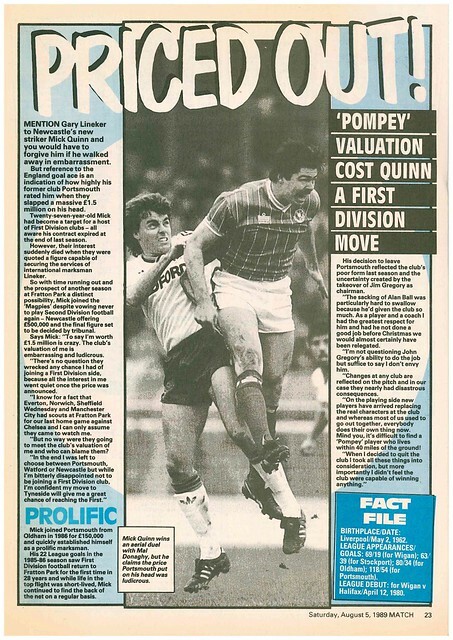 Mick Quinn has just signed for Newcastle, but tells Match of his frustration at being priced out of a move to a top flight club due to Portsmouth’s valuation of him. 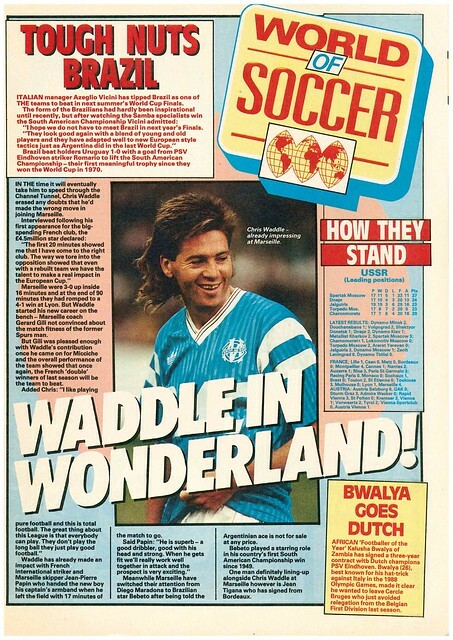 Neil Webb advertises Nike, and Chris Waddle tells Match he is enjoying life at Marseille. Dundee United take on Barcelona in the Quarter-Finals of the UEFA Cup, and this is reflected on the cover of Match, with both sides represented. 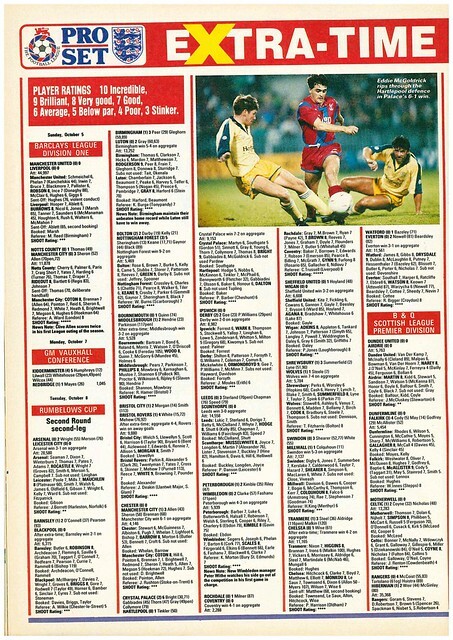 There is a double page profile of the game, as well as a list of all the Quarter-Final games in the three competitions across Europe. Alan McDonald answers questions from readers about plastic pitches, as his club QPR plays on one. 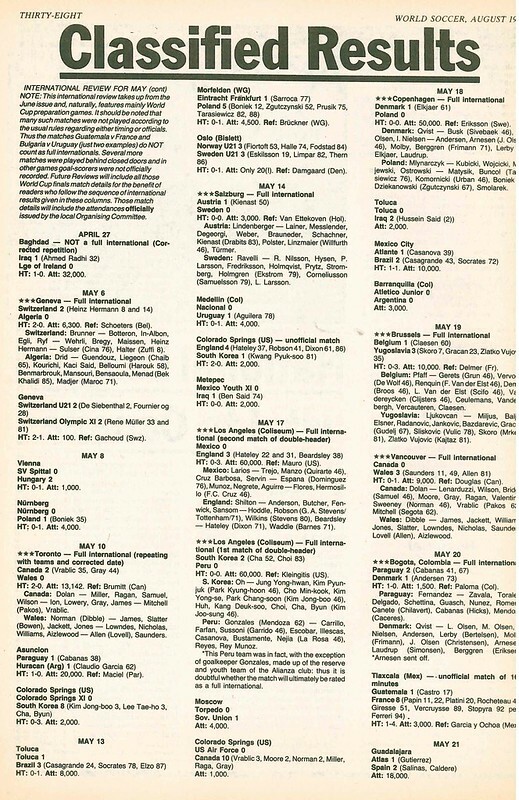 Another big debate is Play-Offs, introduced in 1987, with Match interviewing players and managers from clubs who could be affected on what they think of the idea. 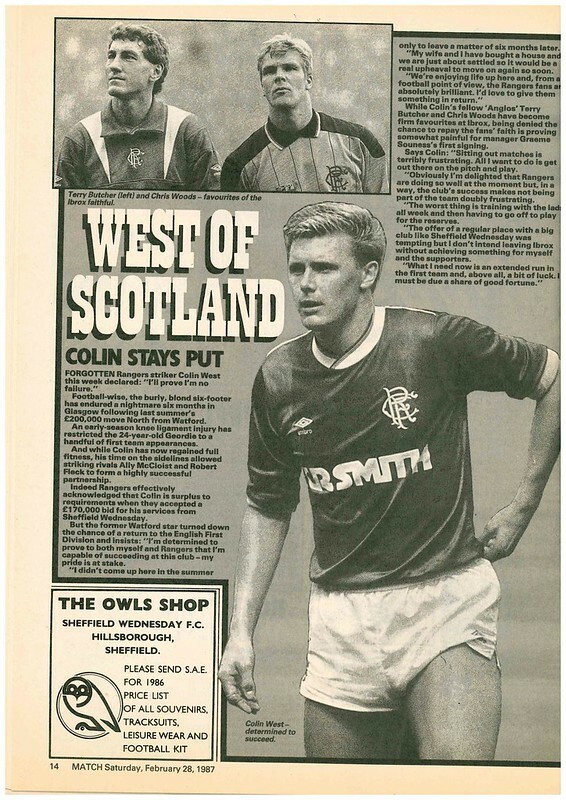 Colin West gets a full page to tell Match he intends on staying at Rangers, while there is a full page profile of Manchester United player Nicky Wood, while Norwich City and Nottingham Forest get club profiles. 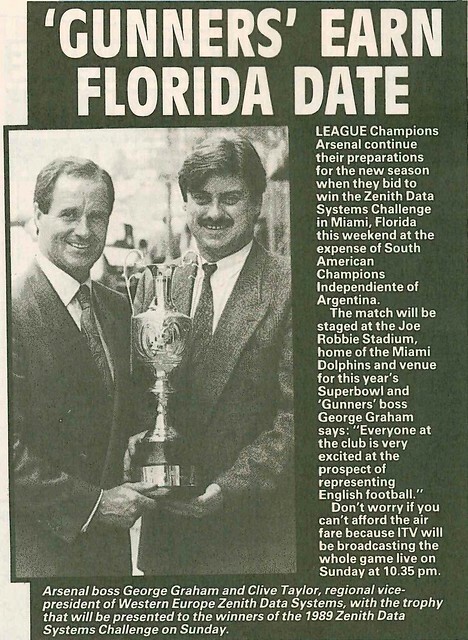 In Scotland, Graeme Souness isn’t coming out of international retirement. 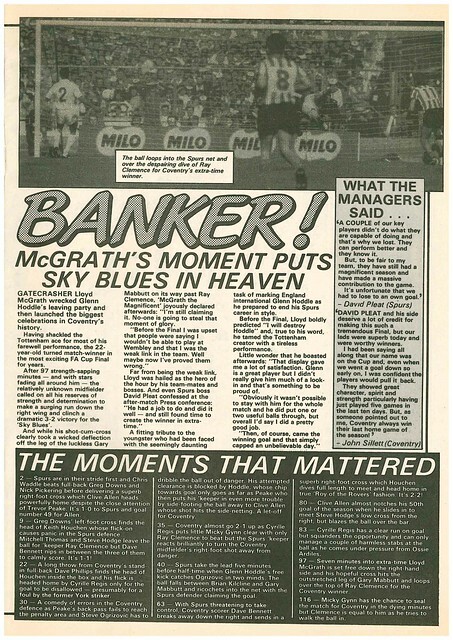 Also not playing for Scotland is Australian born Craig Johnston, who turned down the opportunity to play for Scotland. 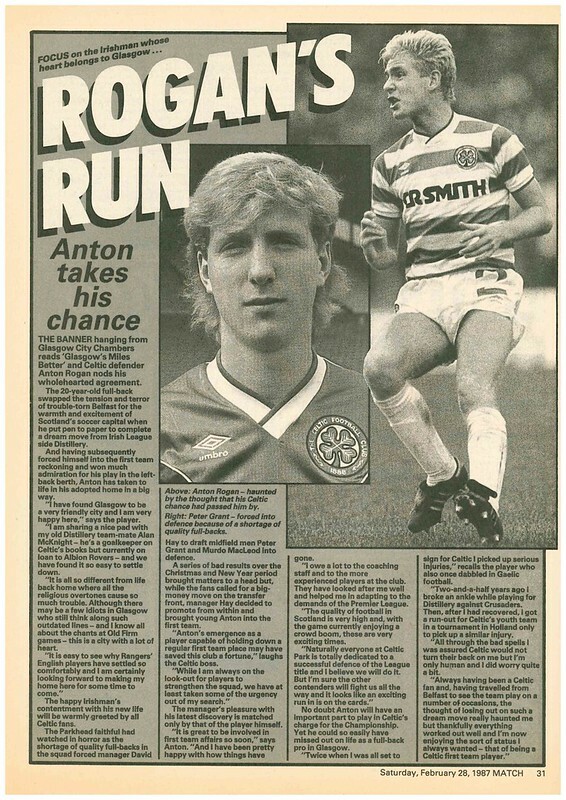 Staying in Scotland, there is a full page profile of new Celtic signing Anton Rogan, who says he enjoys living in Glasgow more than living in Belfast. As the season enters it’s final stages, Match gives it’s predictions for how the season will end, revised from their prediction in August. 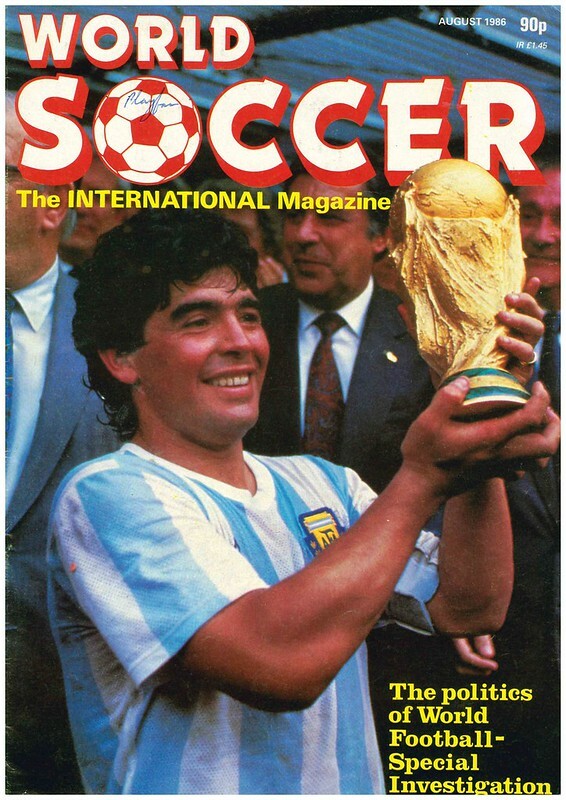 It’s the summer of 1986, and Diego Maradona, holding aloft the World Cup is the cover star of World Soccer, with Mexico 86 still a recent memory. 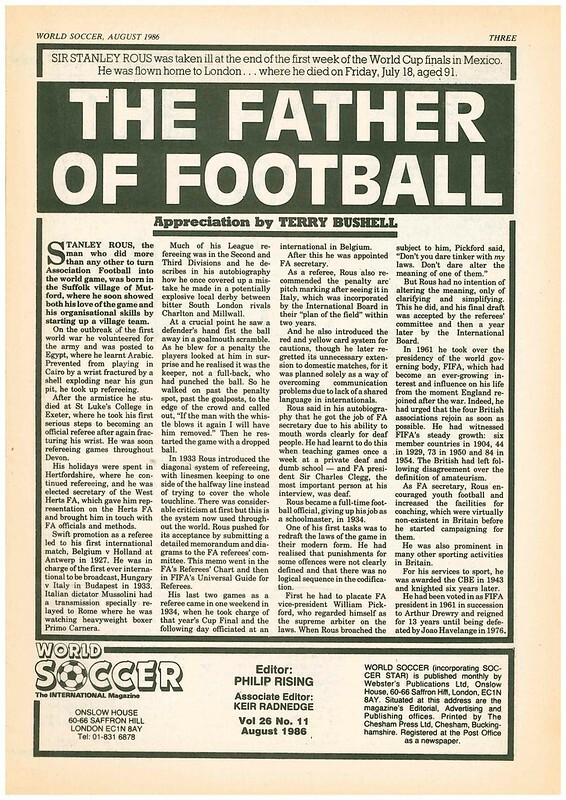 As you open the magazine, there is a tribute to former FIFA President Sir Stanley Rous, described as “The Father Of Football”, who was taken ill in Mexico, and died a few weeks later on his return to London. 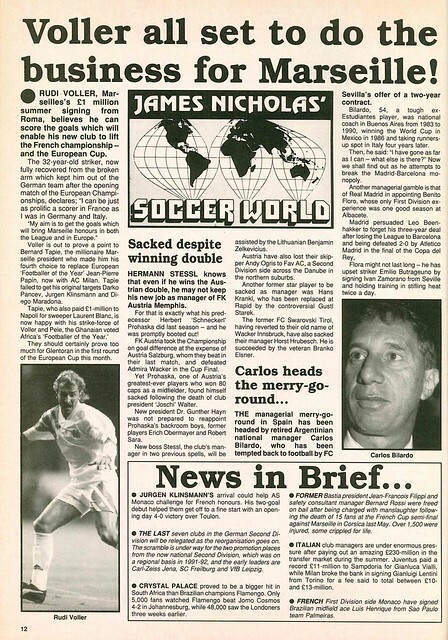 World Soccer views Mexico 86 as a success, but the tournament was not without flaws. Having 24 teams in the finals and allowing some 3rd placed teams to qualify, in their view, encouraged Bulgaria to employ negative tactics against Argentina, as a narrow defeat would put them through. Azeglio Vicini is the favourite for the Italy job, should Enzo Bearzot leave his job as manager of the recently dethroned champions. There is a double page profile of Argentina’s winning squad. 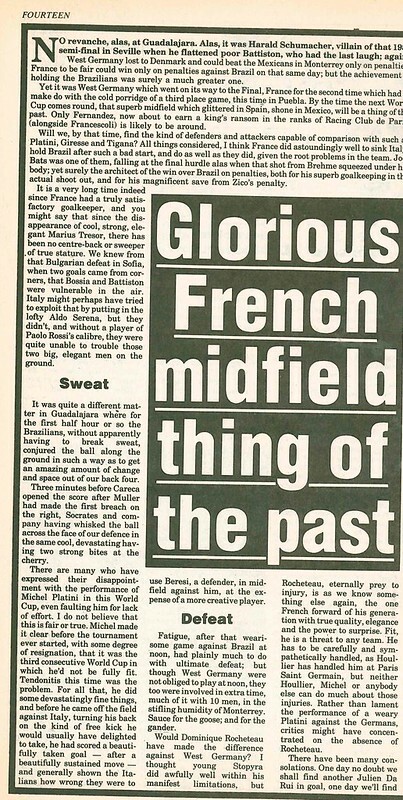 France get a post-mortem, having reached the Semi-Finals for the second successive tournament, where it is declared that their glorious midfield is a thing of the past. 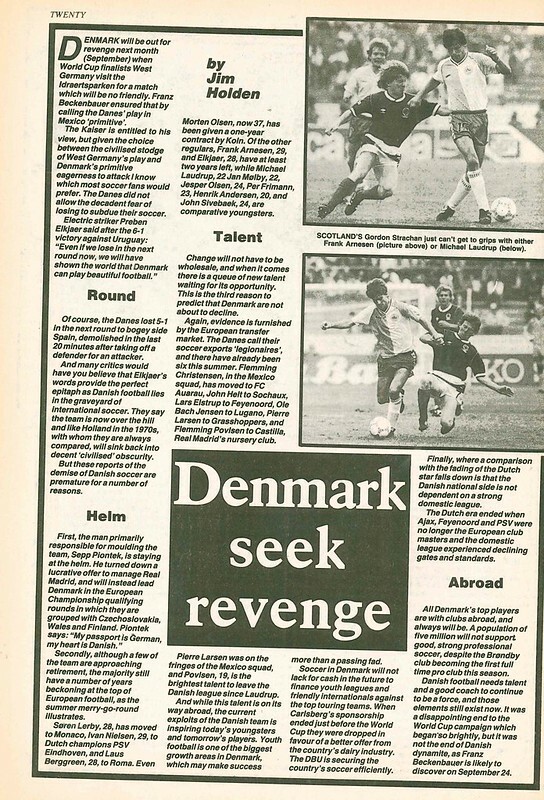 Denmark get previewed, but are looking forward, not back, to an upcoming friendly against West Germany as they aim for revenge against a team they beat in Mexico. Why revenge? 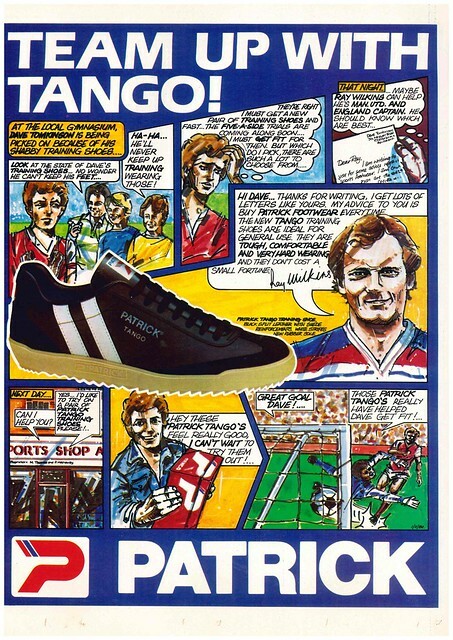 West Germany manager Franz Beckenbauer described their style of play as primitive. England’s post-mortem focuses om the future of Bobby Robson, with writer Eric Batty saying he must stay in the job. 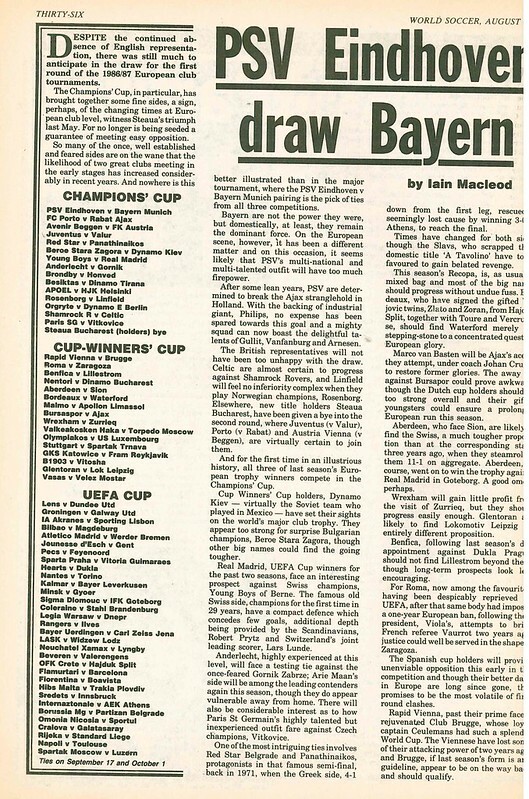 Bayern Munich get a double page feature as they aim to win the European Cup. They came close, losing to Porto in he final that season. 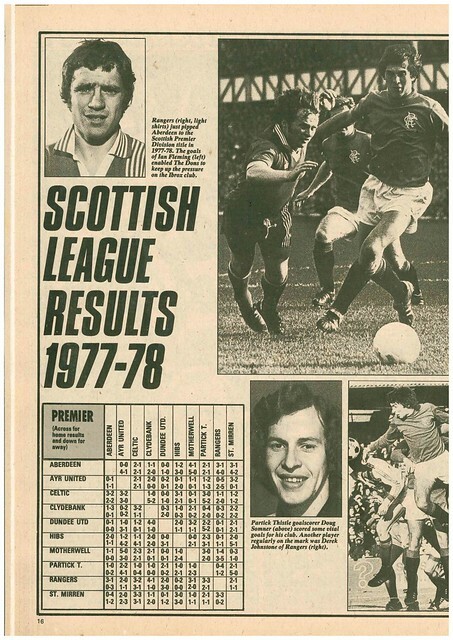 There is a feature on two young Scottish managers in big jobs, Kenny Dalglish who won the League and FA Cup in his first season as Liverpool manager, and Graeme Souness, given his first job at Rangers, and caused a stir by calling them the biggest club in Britain. 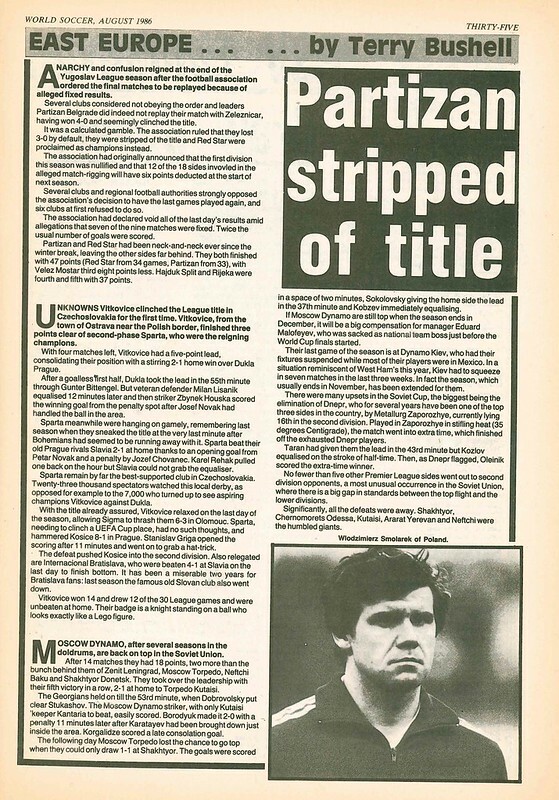 In Yugoslavia, Partizan Belgrade have been stripped of the league title as a result of alleged match fixing. The draws for the 1st Round of the three European trophies are reviewed, with the tie of the round being the meeting of PSV Eindhoven and Bayern Munich in the European Cup. 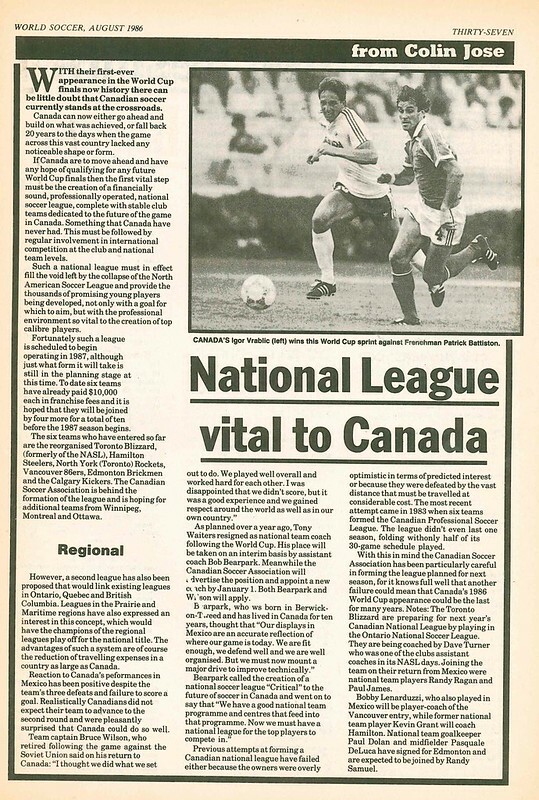 There is a feature about club football in Canada, or rather, the lack of, something which World Soccer says is vital is they want to capitalise on reaching their first World Cup. 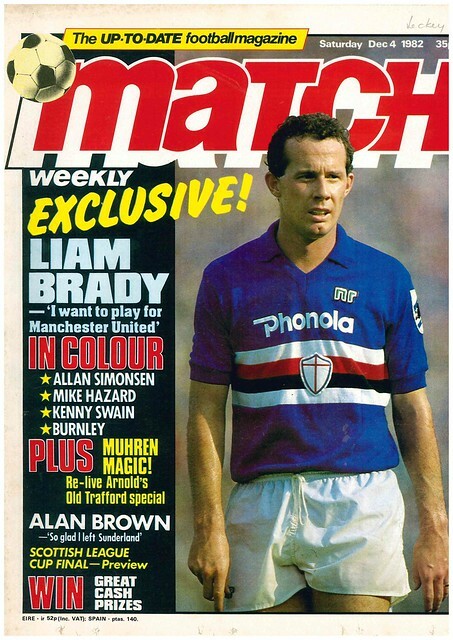 Liam Brady of Sampdoria is the cover star of this editon of Match as he reveals that he wants to sign for Manchester United, but not until the summer of 1984 when his contract with Sampdoria expires. 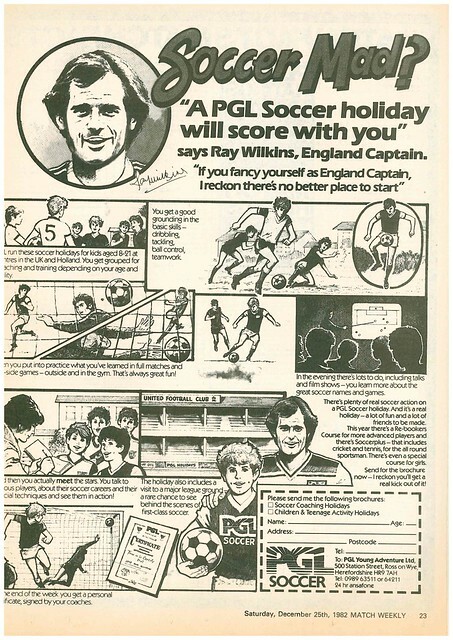 Ron Atkinson didn’t take him up on the offer. 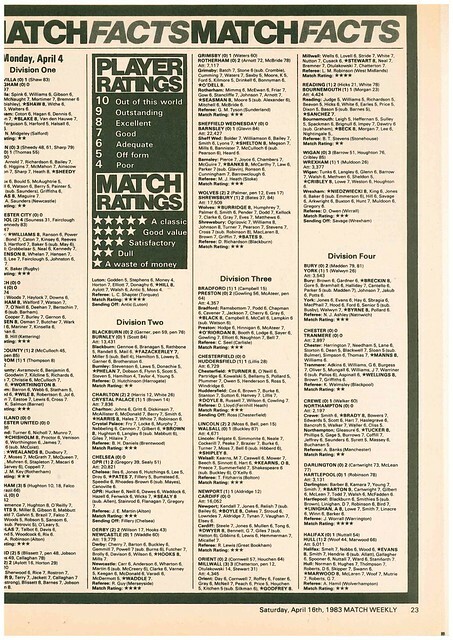 Spanish football wasn’t all Tiki Taka in 1982 with players who have faced Spanish sides recently and even players playing in Spain complaining that the quality of play is poor due to the volume of fouls. 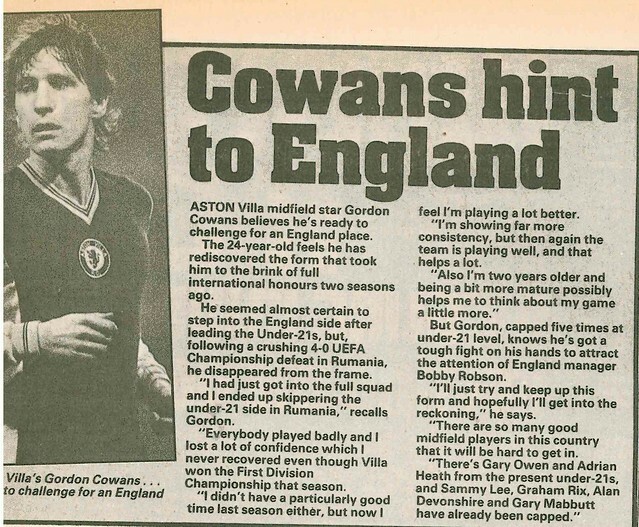 Meanwhile, Gordon Cowans of Aston Villa says he is back in form and ready to battle for a place in the England team. One man who isn’t getting in the England team is Glenn Hoddle, who uses his column to bemoan his bad luck with injuries recently. It’s the Scottish League Cup Final this weekend, and Match interviews Danny McGrain and John McClelland ahead of the game. 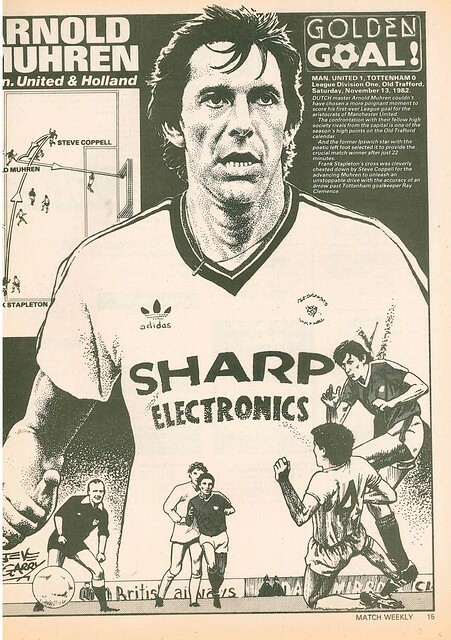 Arnold Muhren’s recent winner for Manchester United against Tottenham Hotspur gets the Steve McGarry treatment with a full page sketch. 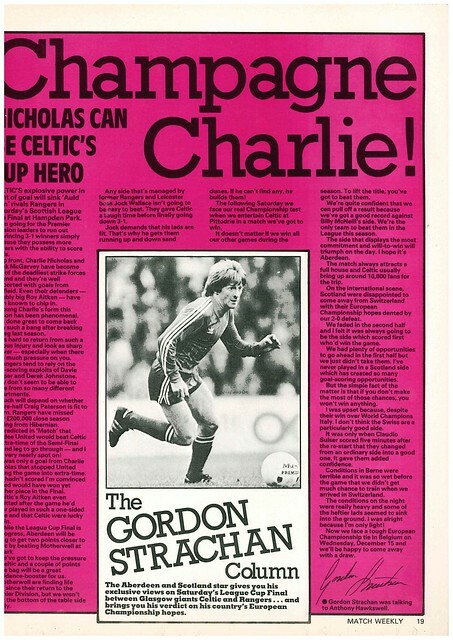 Gordon Strachan of Aberdeen previews the Scottish League Cup Final in his column, predicting that Charlie Nicholas of Celtic will have a big say in the outcome. Paul Mariner uses his column to plead with Alan Brazil to stay at Ipswich Town after the striker handed a transfer request. 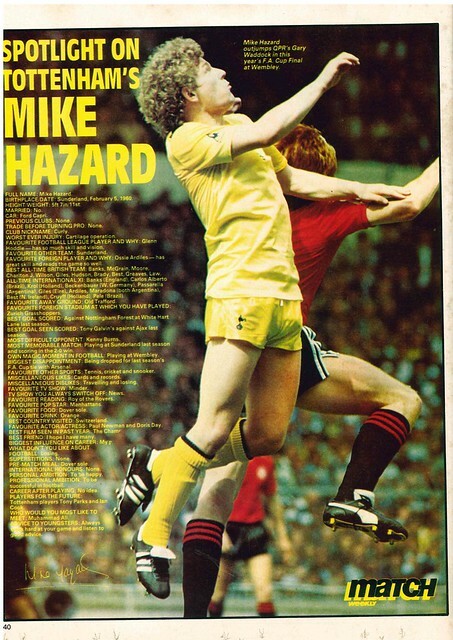 The magazine ends with a profile of Mike Hazard of Tottenham, who reveals his biggest TV turn-off is the news. 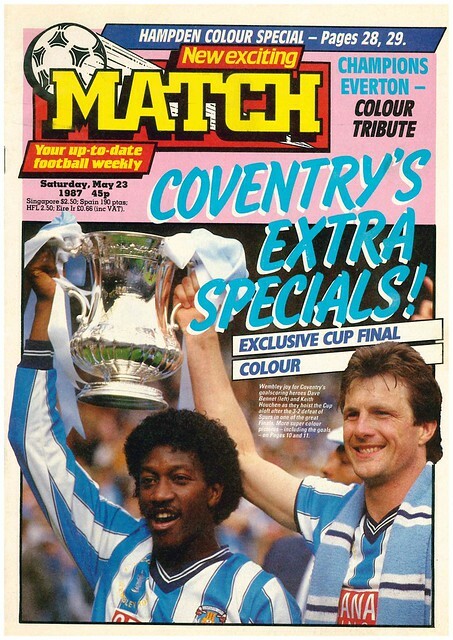 Keith Houchen and Dave Bennett of Coventry City are the cover stars as Match reviews the 1987 FA Cup Final. Both players, holding aloft the trophy, were the two Coventry players to score. The winner came via Gary Mabbutt own goal. 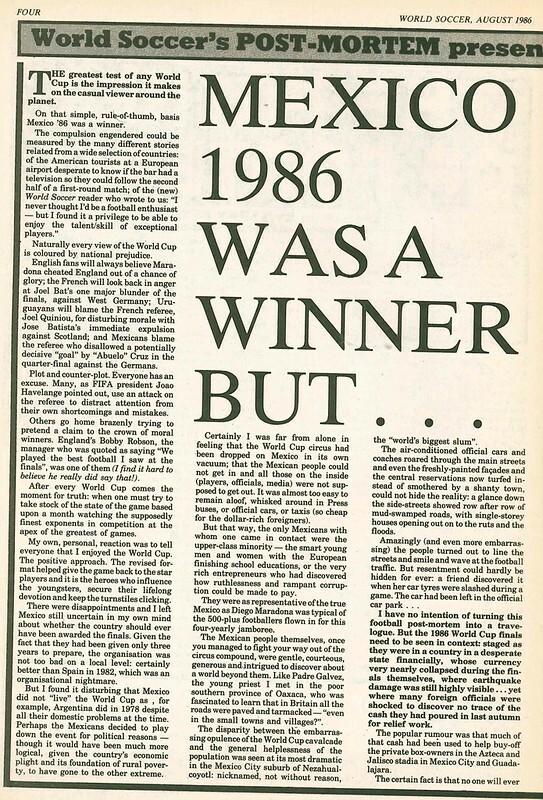 The headline “Coventry’s Extra Specials” makes reference to the fact the game went to extra-time, as well as one of Coventry’s biggest exports of the 1980s, the band The Specials. 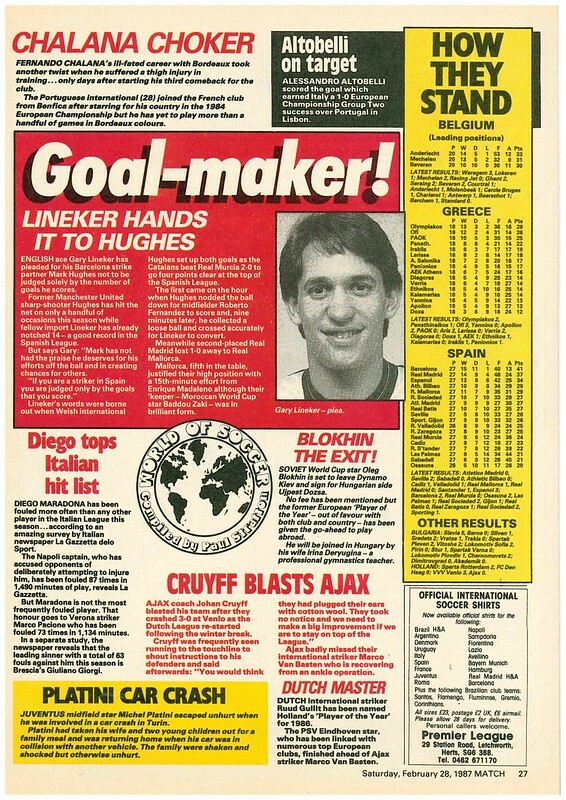 That match at Wembley gets a double page report as you open the magazine. 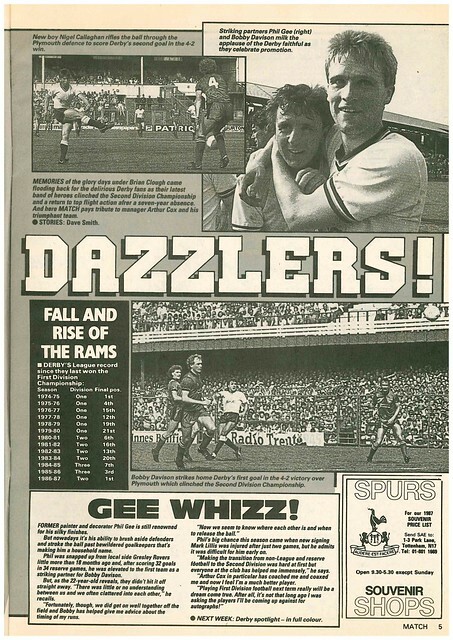 Derby County get a double page spread as they have returned to England’s top flight for the first time since 1980, the club having fallen into decline, being relegated to Division Three in 1985, just ten years after being League Champions in 1985. 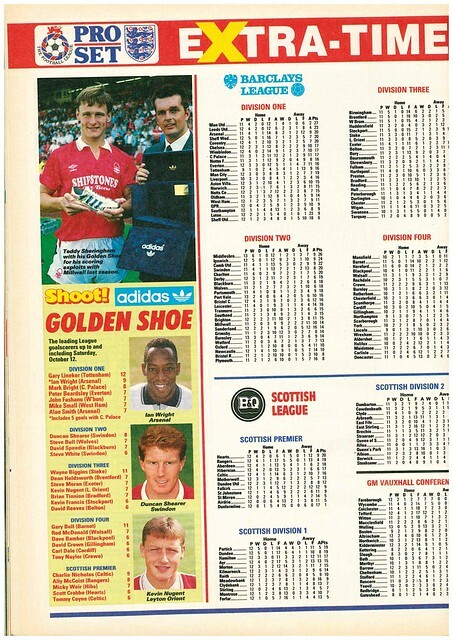 England are playing Scotland in the annual fixture, which gets a double page spread. Scarborough have made history by becoming the first club to win promotion to the Football League, and they get a double page spread. 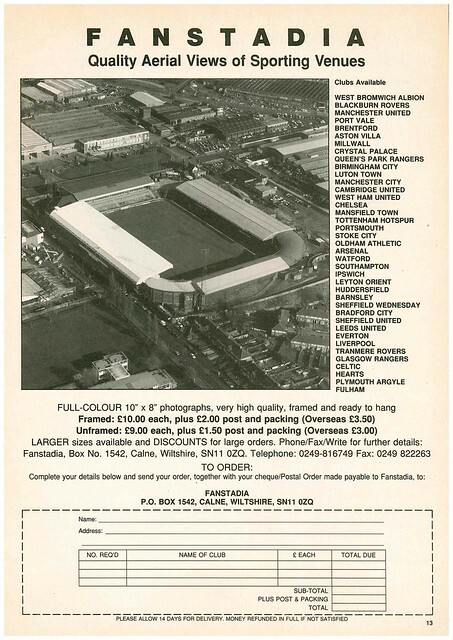 Also celebrating promotion in 1987 were Portsmouth, who get a double page spread, having narrowly missed out in 1985 and 1986. 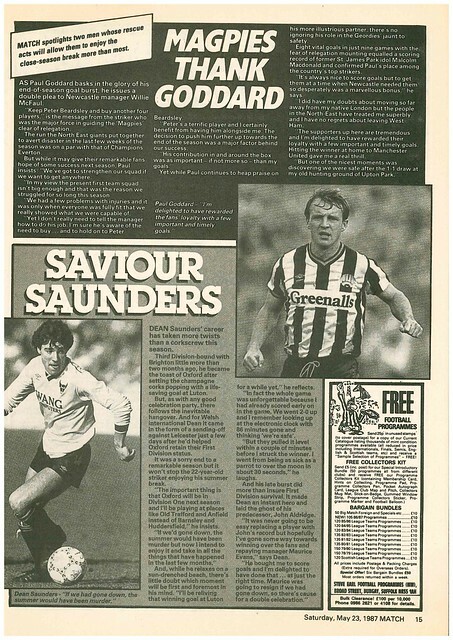 It’s not just about promotion, Match also looks at players who helped their club avoid relegation – Paul Goddard of Newcastle and Dean Saunders of Oxford. In foreign news, Trevor Francis scores a title winning goal in Italy, as his goal for Atalanta against Inter Milan wins the title for Napoli. 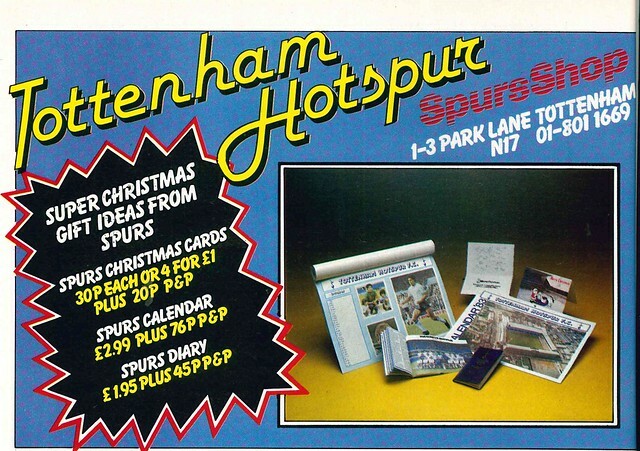 There is a full page profile of Torquay United and Tottenham Hotspur. In news, Manchester United have started using a computerised fitness testing programme called Body Talk. 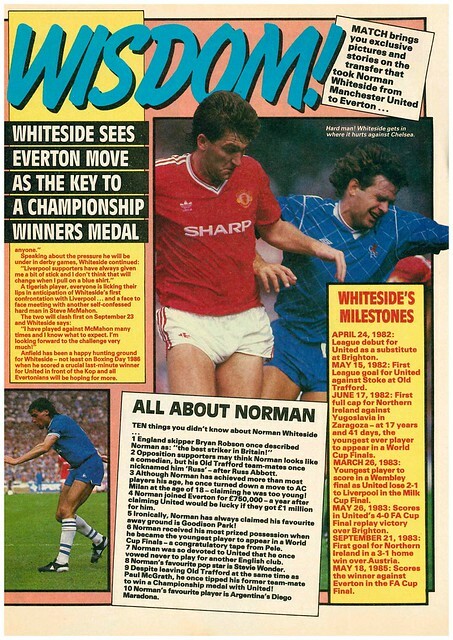 Also getting a full page profile are Everton having just won the league. Scotland isn’t left out, with posters of cup winners St Mirren and champions Rangers. Staying in Scotland, Celtic are planning a summer spending spree after agreeing a sponsorship deal with CR Smith. Scottish striker Joe Jordan gets a profile, as he prepares to play for Bristol City in a second successive Freight Rover Trophy Final, against Mansfield Town. 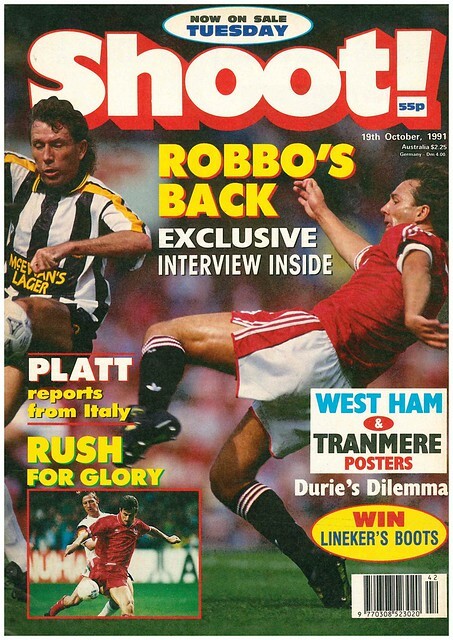 Bryan Robson, in action against Notts County, is the cover star, with the headline “Robbo’s Back”, as he is interviewed in this edition. As you open the magazine, there is a double page feature on Wales European Championship Qualifier in Germany, where Wales need a draw to virtually qualify for the finals in Sweden. 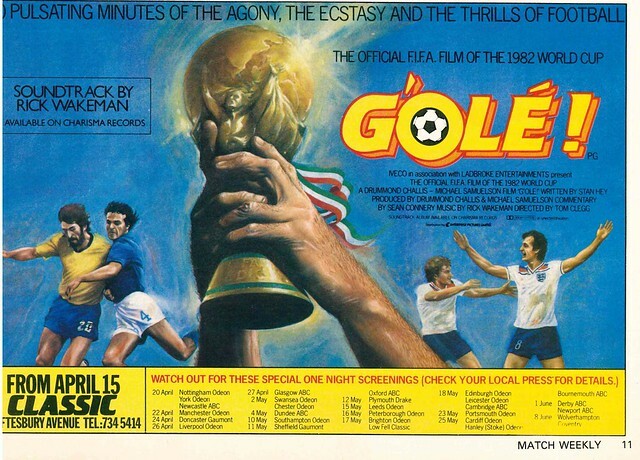 Jimmy Greaves assesses the two teams and predicts a win for Germany, and so it proved, with Germany winning 4-1. 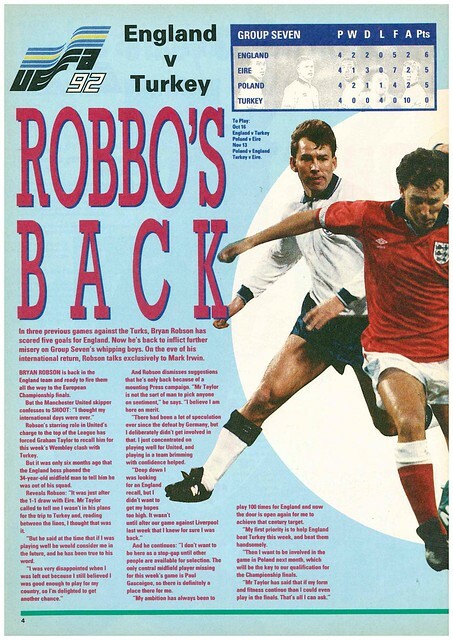 Bryan Robson’s interview is part of Shoot’s preview of England’s European Championship Qualifier against Turkey. Turkey had been good opponents for Robson, with 5 goals in his 3 previous appearances against them. England’s previous game against Turkey saw Robson left out of the squad, and he thought his international career was over at the age of 34, but his recent form for Manchester United saw him earn a recall. As it turned out, the game against Turkey was Robson’s last cap for England. Another player making an England comeback was Stuart Pearce, who explains that he was left out of the squad for the recent friendly against Germany as he was serving a domestic suspension. 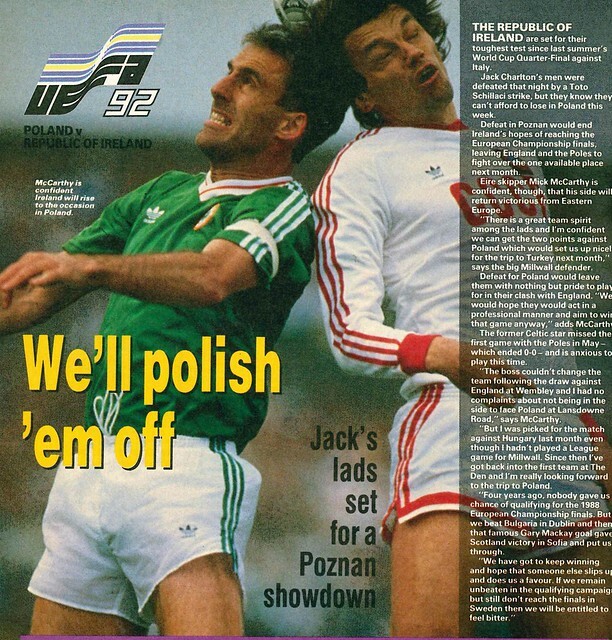 Elsewhere in the group, Republic Of Ireland face a crunch game in Poland, and Shoot interviews Mick McCarthy in preparation of this. 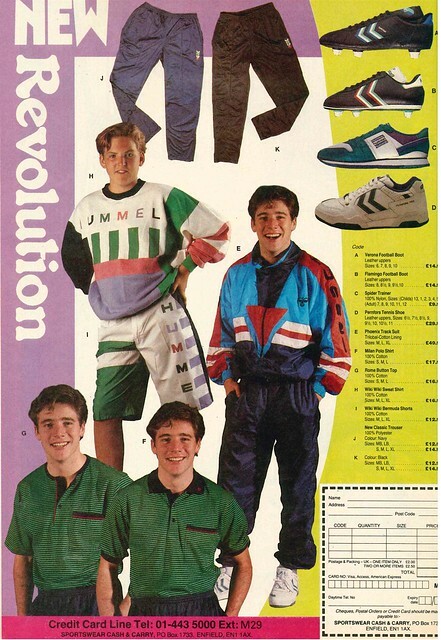 In news, Charlie Nicholas had all his medals stolen after a burglary at his house, while Celtic have had a bid rejected for Terry Phelan, while Chelsea are planning a move to sign Matt Le Tissier. 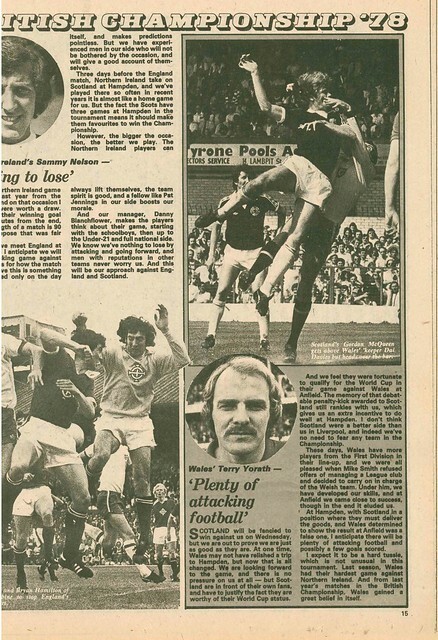 Also in Scotland, John Robertson of Hearts gets a double page interview where he says that Hearts are determined to bounce back after defeat against Celtic, their first of the season. Robertson also gives Shoot the lowdown on his Hearts team-mates. 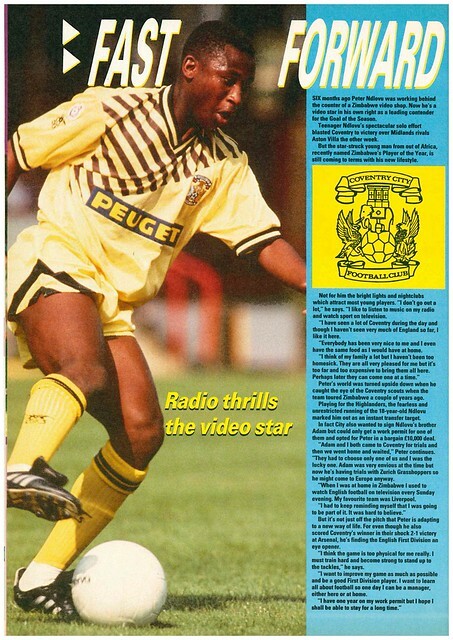 Peter Ndlovu of Coventry City gets interviewed s he adjusts to life in England, telling Shoot that he mostly listens to the radio and watched TV. Also adjusting to life in a new country is David Platt, who tells Shoot he is enjoying life in Italy, despite Bari not winning a game and their manager resigning. Talking of English players in Italy, former AC Milan striker Mark Hately rubbishes former Bari striker Paul Rideout’s claim that no English striker has come back from Italy a better player. 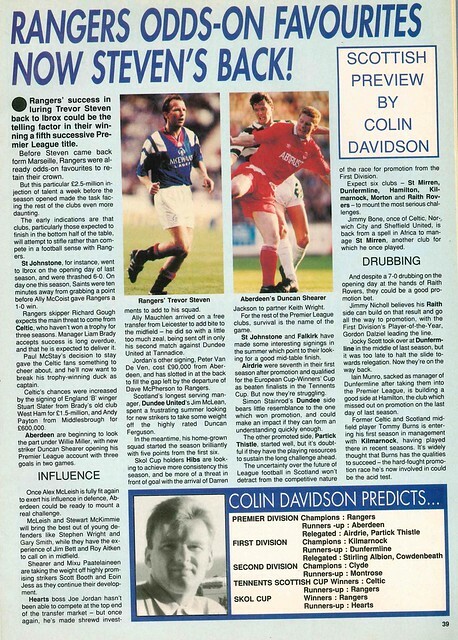 I wonder did they discuss the matter a few months later in the dressing room when Rideout signed for Rangers? 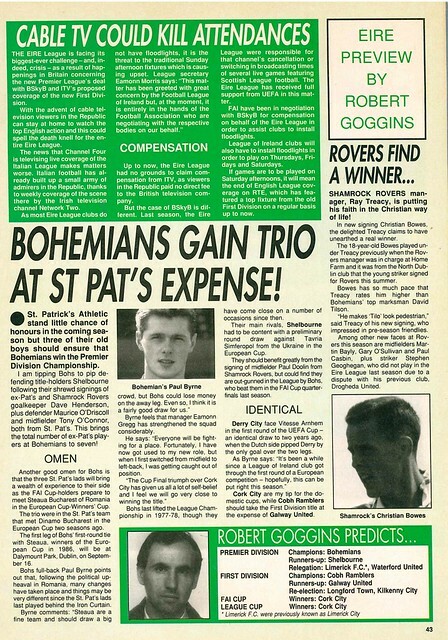 Talking of Rangers, a reader writes to Jimmy Greaves to say that Rangers will continue to be minnows on a European stage due to a lack of competition in Scotland, while another reader asks about the possibility of Leeds winning the league, and Greaves says they need Lee Chapman to start scoring in order for that to happen. 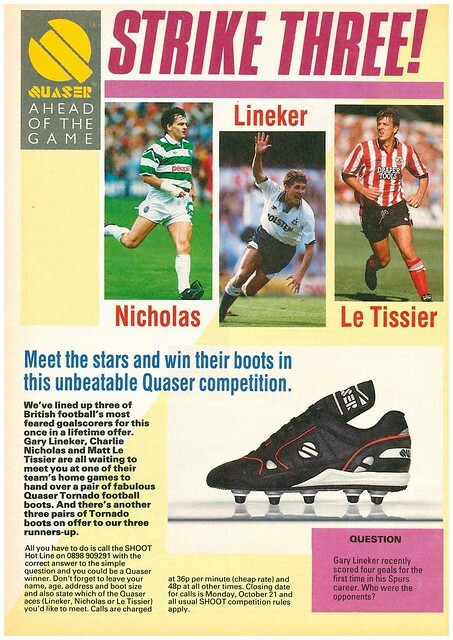 In competitions, you could win a pair of Quaser boots, and get to meet Gary Lineker, Matt Le Tisser or Charlie Nicholas at one of their respective team’s home games. 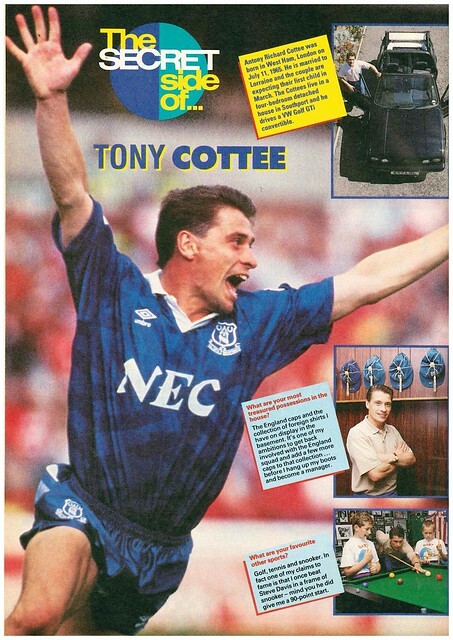 Tony Cottee gets a profile, revealing that if he wasn’t a footballer, he would be a Fireman, or work for his dad as an Insurance Broker. 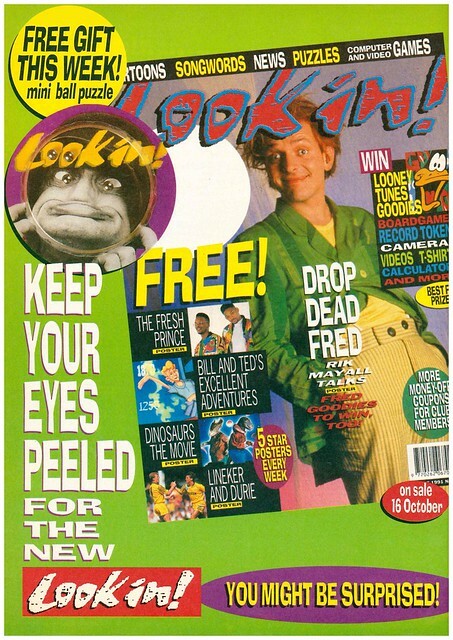 In ads, there was an advert for a teen mag called Look-In (possibly an IPC publication, I can’t verify) which had Rik Mayall as it’s cover star, talking about his role in Drop Dead Fred. 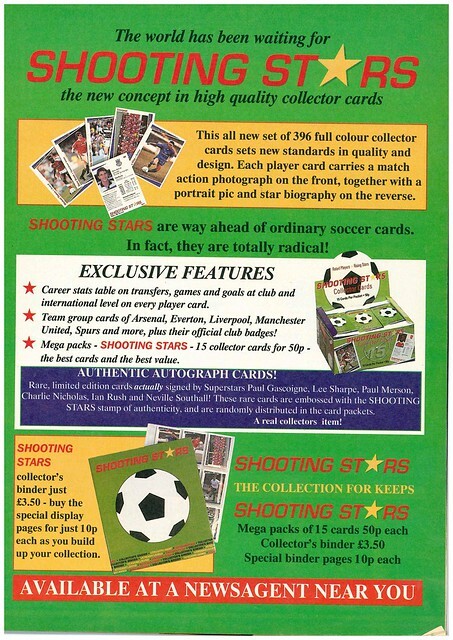 Alongside that, is an advert for the following week’s edition of Shoot, which comes with free Pro Set cards. 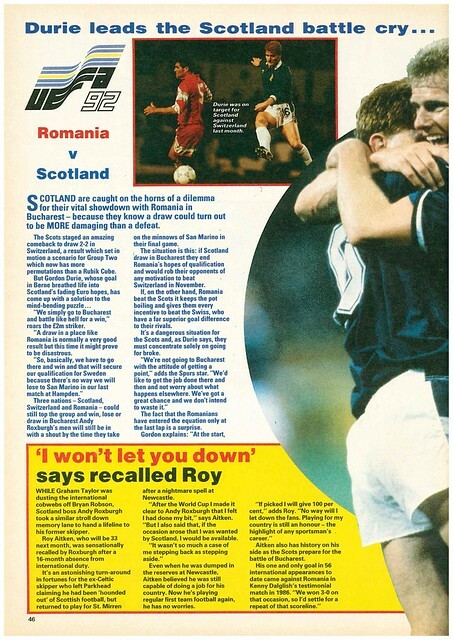 The magazine ends with a double page feature on Scotland’s European Championship Qualifier in Bucharest where a win would virtually guarantee qualification to the finals. They lost, but other results went their way which meant they made it to Sweden.